On the Trail of a Whale. My Holy Grail. 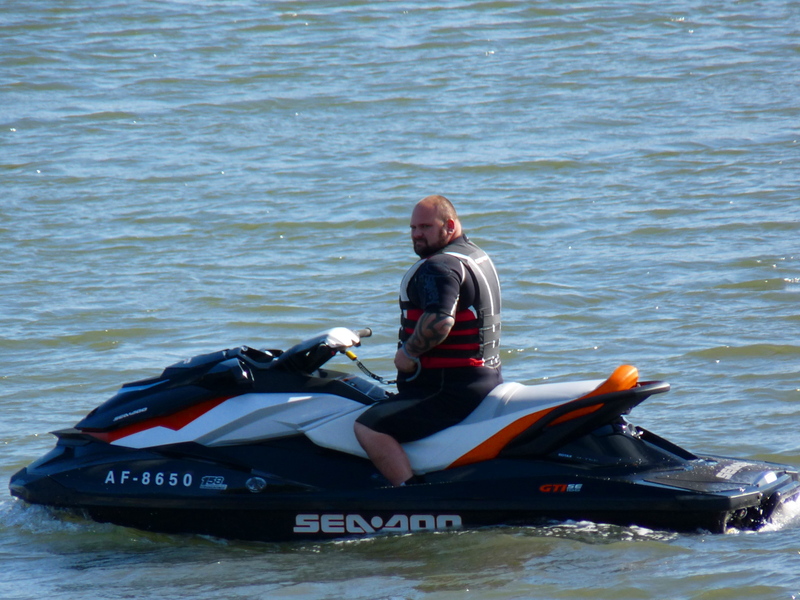 Following a total knee replacement at the beginning of the year, and all the inactivity and slobbing about thereafter, it was imperative I got back onto the water as soon as possible. 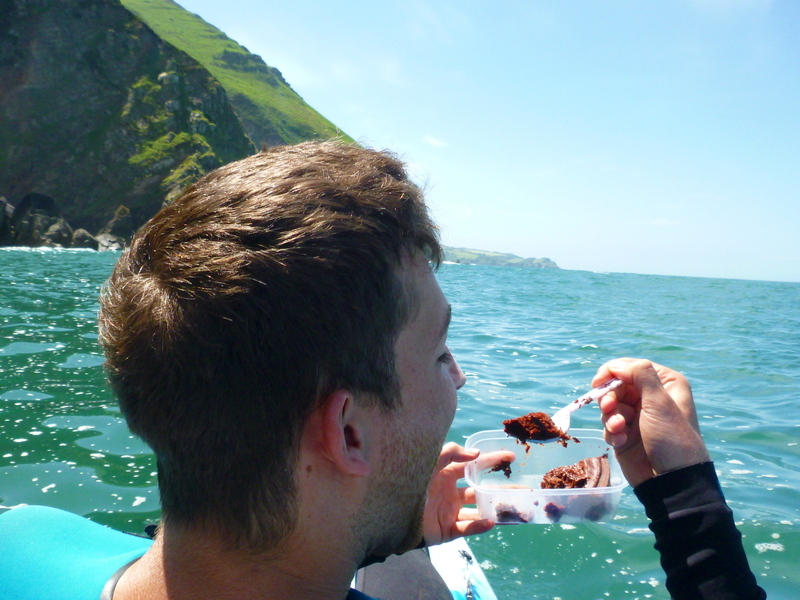 Paddling a kayak is the perfect antidote to chocolate hobnobs and daytime TV. And if you get a move on you can be back in time for ‘Pointless’ anyway. It probably isn’t the best from of exercise to bulk up the leg muscles following knee surgery, in fact huge amounts of time sitting in a boat with ‘vestigial’ legs (as my chum described them) probably contributed to the problem in the first place. But what the heck. It’s good for the soul. I started off with flat water. Bude canal and Roadford Lake. Superb. As the Spring got going the surrounding bushes and trees were a cacophony of birdsong. 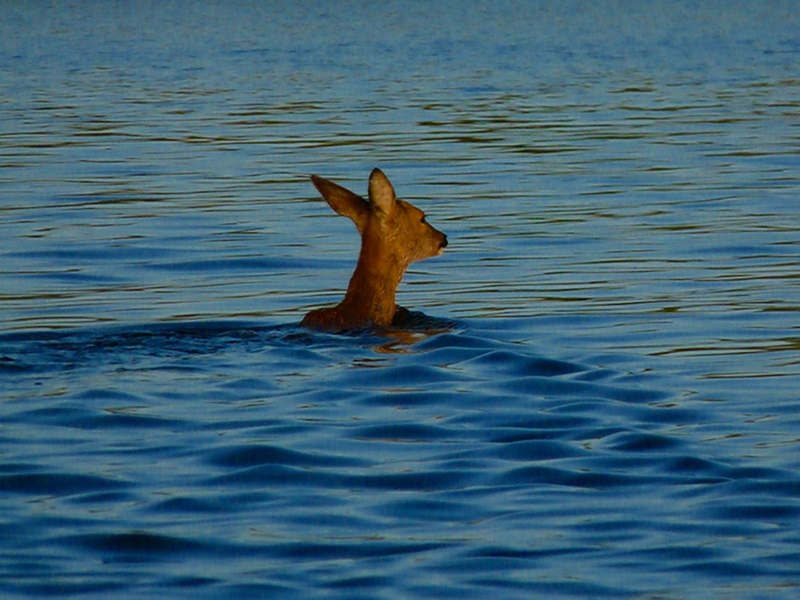 I certainly wasn’t expecting to encounter a Roe Deer swimming a mile across the middle if the lake. As the sea settled down after winter we cherry-picked sheltered sections of the Southwest coast to explore during daytrips. Charmouth, Lyme Regis and the Jurassic coast. 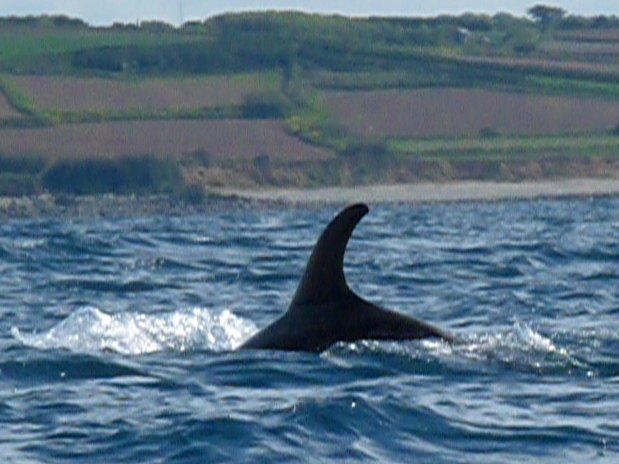 Dave and I spent a tremendous sunny day around Gerrans and Veryan Bay in South Cornwall, featuring my first cetacean encounter of the year…..a very small porpoise, and a fantastic aerobatic display by a cornish Chough including a gravity defying g-force loop, with its legs on the OUTSIDE of the circle. Reminiscent of the Eurofighter at Dawlish air display. 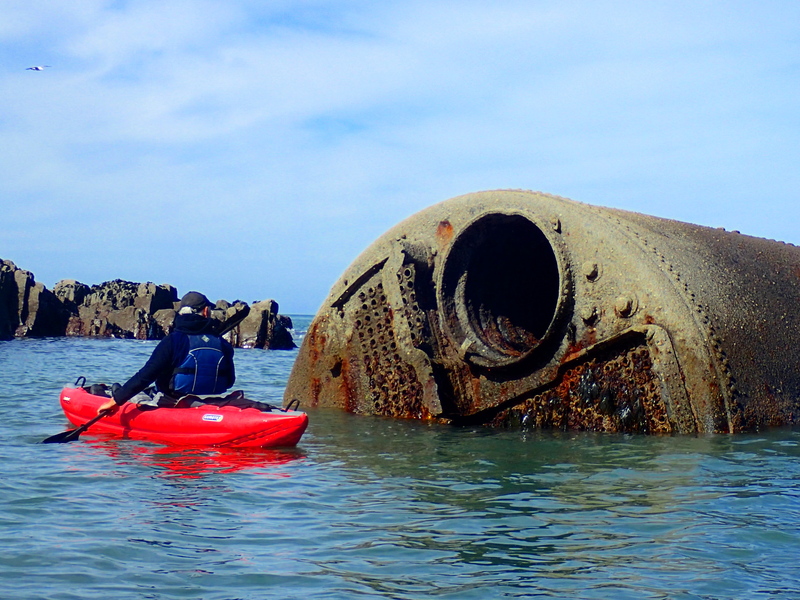 And when eventually the swell abated on the ragged North Cornwall coast, making it accessible for kayaking for about the first time in six months, we wasted no time in a tour along the Hartland Heritage Coast. As the sea began to warm up and the sandy bays echoed to the grating calls of migrating Sandwich terns, I thought it was time to concentrate on a bit of dolphin spotting. My paddling fitness had returned which made me a bit more confident about doing some offshore paddling. However this was not necessary for my first dolphin encounter of the year….a pod of Risso’s dolphins which I picked up right outside the entrance to Newlyn harbour and followed for a mile to Penlee point. Like Bottlenose Dolphins they cruise along at 5mph so take a bit of keeping up with. A superb encounter, my best views yet of Risso’s dolphins. They showed their typical colour variation: one almost white, one almost black and one pale grey with a characteristics pattern of scars on its dorsal fin that would allow individual identification (which I am following up). 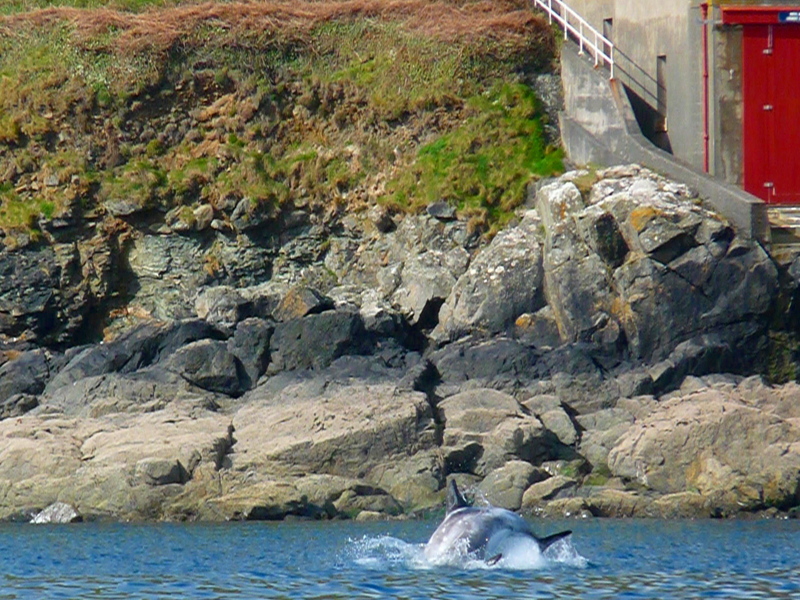 The scarred dolphin did a respectful little jump right beneath the slipway of the old Penlee lifeboat, used for the last time in December 1981 when the lifeboat, and the entire crew, were lost while carrying out a rescue. 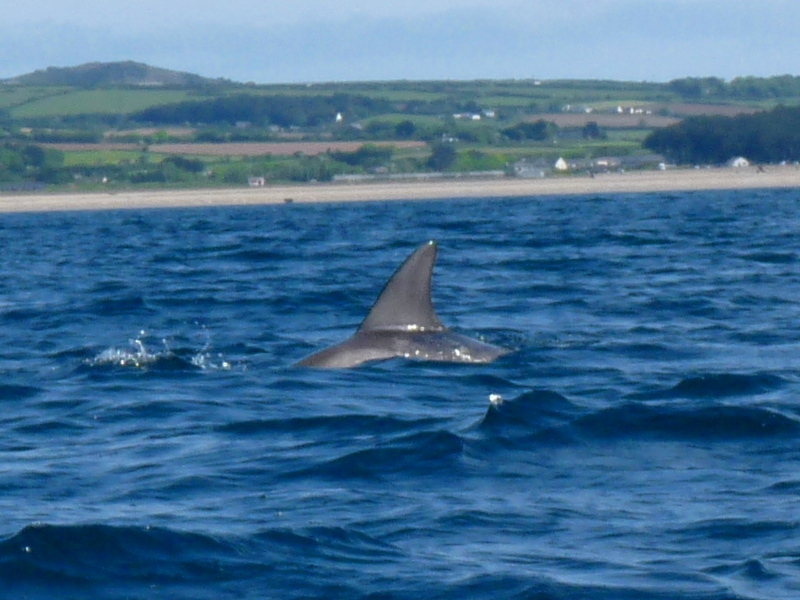 My second dolphin encounter of the season was a distant view of a fast moving pod of Bottlenose dolphins at Pentewan beach, Mevagissey. No photos, too far away. 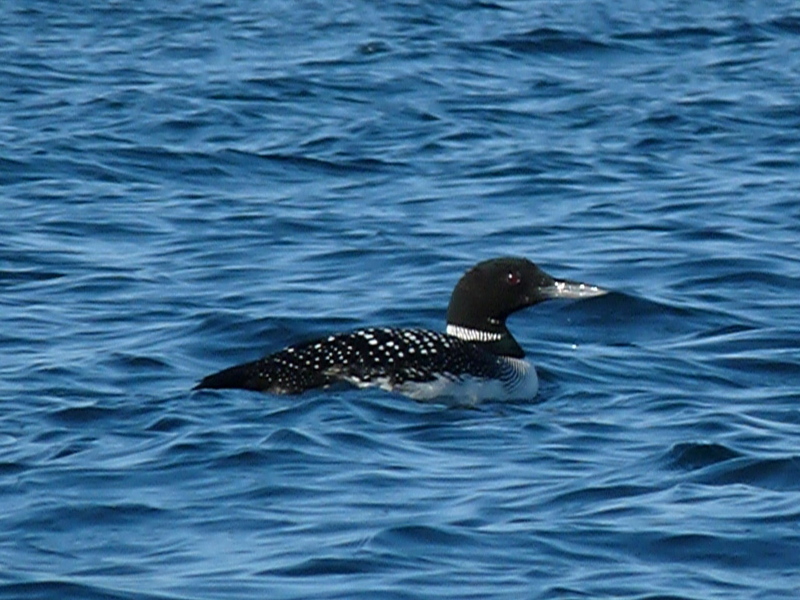 The only other notable ingot of wildlife on that day was a Great-Northern Diver dressed up in its spectacular breeding plumage. Most have departed for the far north by the time they have changed into their smart clothes, but this year for some reason many have been slow to depart. In fact I saw one still lingering on 18 June. To complete my dolphin species hat-trick I had to make a bit more of an effort. 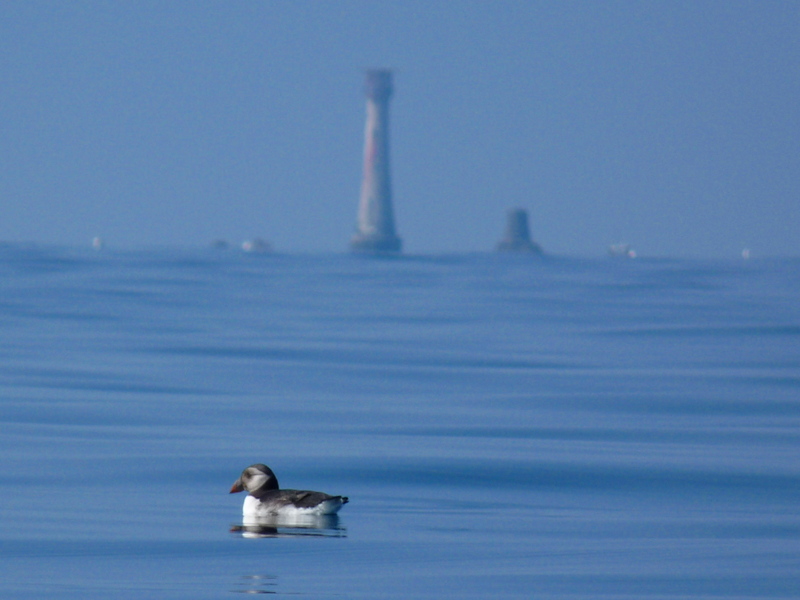 Common dolphins usually keep further offshore so I thought a jaunt out to the Eddystone Lighthouse, ten miles beyond Plymouth breakwater, should do the job. I wasn’t disappointed. On the way back I found myself amonst a group of about a dozen Common dolphins which surged all around for a couple of minutes. 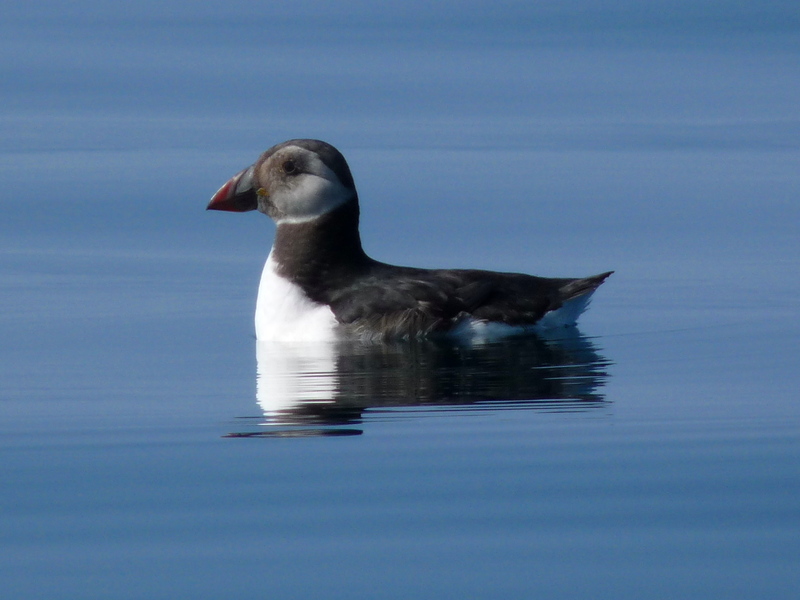 Throw a few porpoises, a Sunfish and a dozen Puffins into the mix and it was worth the strain. 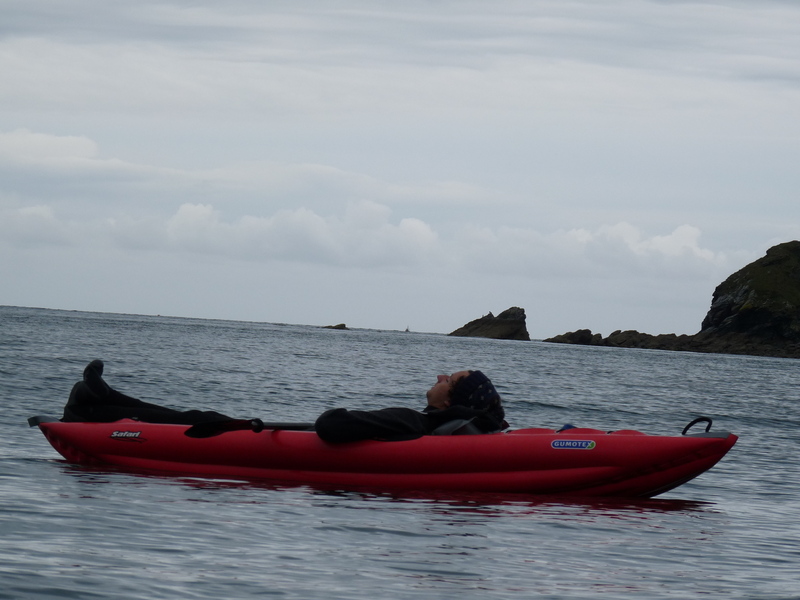 With the reported sightings of several Minke whales in the west of Cornwall, plus a handful of Humpbacks and the amazing record of a Bowhead whale loafing about only just off the beach at Penzance, a whale encounter from my kayak has got to be my next big wildlife goal. In the UK of course. OK it’s not going to happen. But it just might. 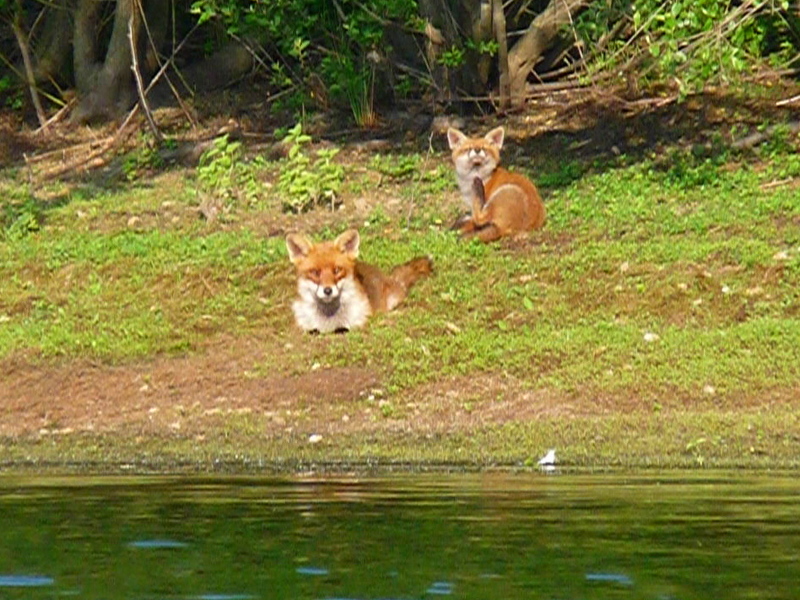 Till then I’ll just have to be happy with the local foxcubs (viewed from the kayak, of course). 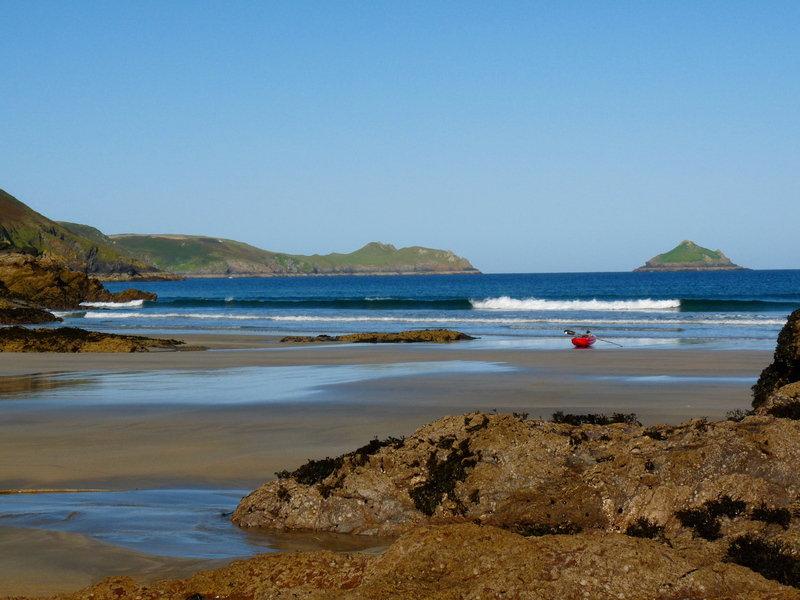 And if all else fails, find a deserted ‘kayak only’ beach and just enjoy the scenery. This particular wordpress blog has now run out of space to download photos. 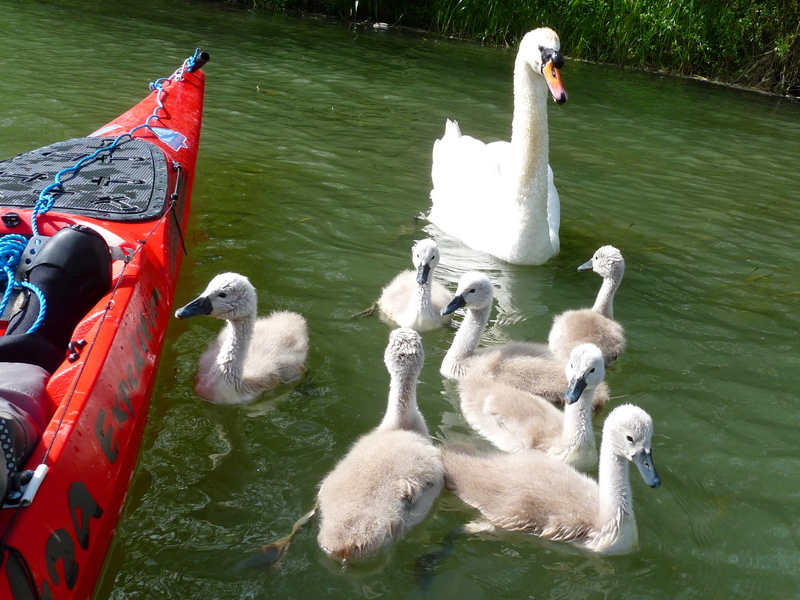 And as I seem to have ‘gone off ‘ the fishing side of things for the time being, in favour of touring and wildlife encounters, I will write future blogs at thelonekayaker.wordpress.com. 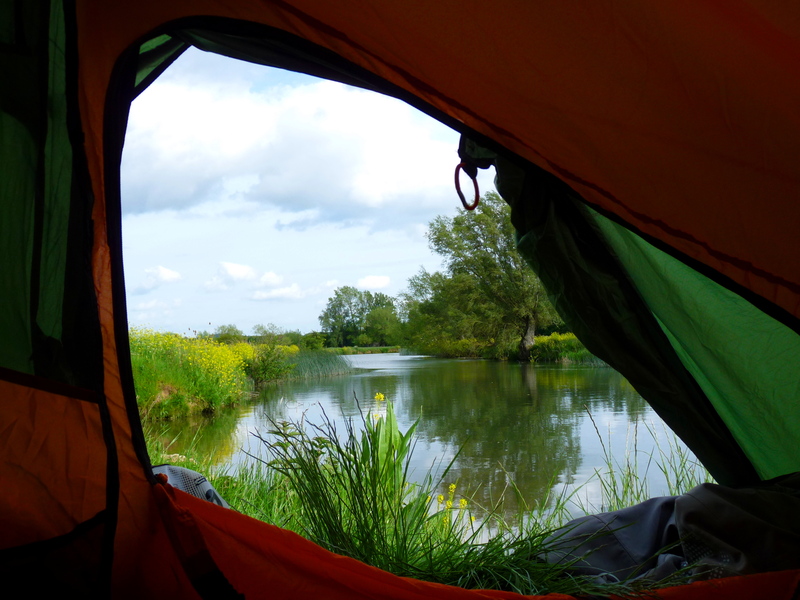 It’ll be non-stop action, superb wildlife and the best of UK paddling. Hopefully. ounters.wordpress.com. Follow my adventures there. The open sea and exposed coast is always my favourite paddling environment. It’s just so exciting, especially down here in Devon and Cornwall. The scenery alone is enough to fulfil all your requirements for a good day out. But for me its the expectation of an extreme wildlife encounter that makes me go back time and time again. A peregrine scorching across the sky, the glimpse of a dolphin’s fin, the snore of a sleeping seal, a fox hunting along the shore. It’s so easy to take it all for granted. Kayaking is by far the best way to see all this stuff. It’s silent. Not having an engine means you can hear the marine equivalent of a pin being dropped. The piff of a porpoise, the ‘thoomph’ of a distant gannet hitting the water, the snicker of a little gang of purple sandpipers creeping amongst the barnacles.Or the high-pitched squeak of an otter up one of the rivers. 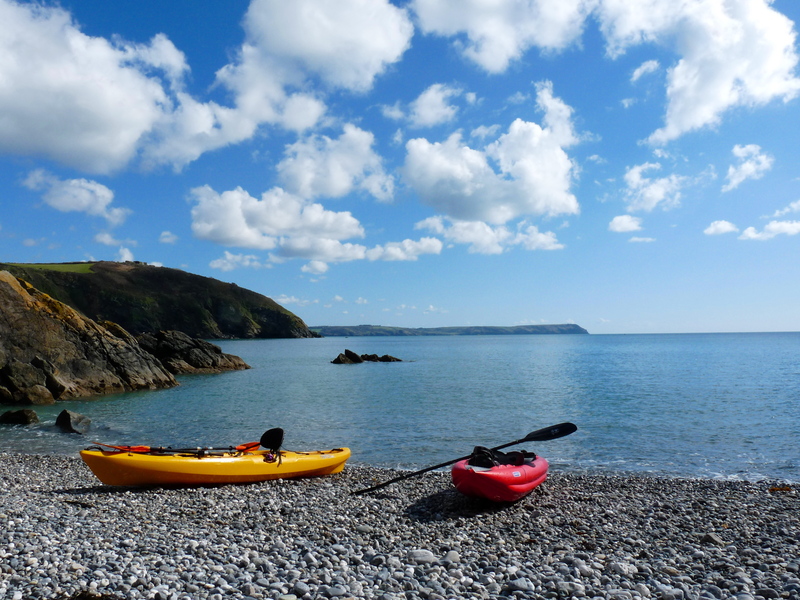 The weather ensures that the north coast of Devon and Cornwall will never get crowded with kayakers. There has not been a single day in the last three months that has been suitable for the open coast. Almost incessant wind and huge waves. On the handful of windless days the groundswell has been prohibitive. So it was a wise move to make the effort to go to Boscastle at the end of September, on probably the last calm day there of the summer. And it was amazingly flat with no wind and a very rare completely swell-free day. Any sort of lumpiness at all makes going into the amazing caves and ‘zawns’a bit uncomfortable and edgy. Not to mention the exposed headlands. 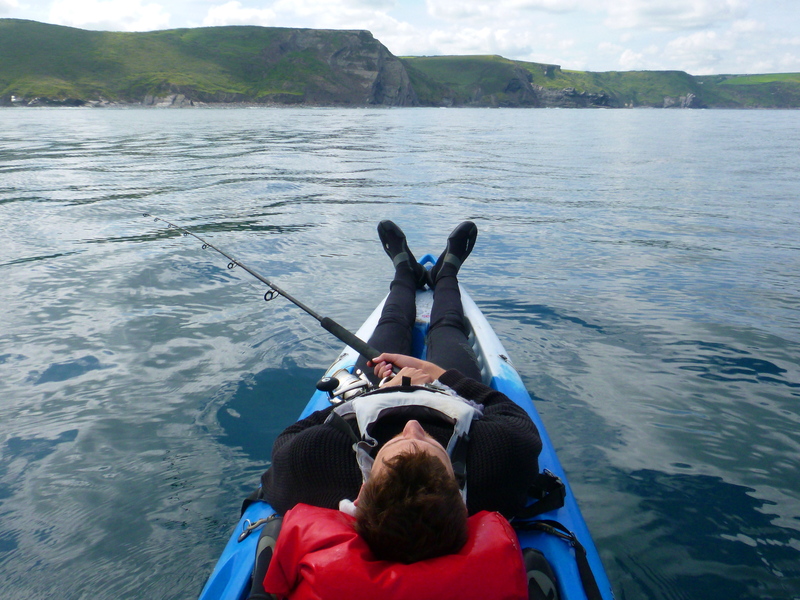 Boscastle down to Tintagel is one of the UK’s best paddles. You can do a sort of circuit. Paddle half a mile offshore and follow the tide down, admiring the coast from afar, and then return investigating every twist and turn and gulch and cave and waterfall and island and beach. There’s a lot of fish here as they are protected by the fisherman-hostile environment. The turning point of the trip is Tintagel island. In the summer time there are always a lot of tourists here who do a lot of aimless milling about (or are they reeling from the extortionate entry fees to King Arthur-land?). 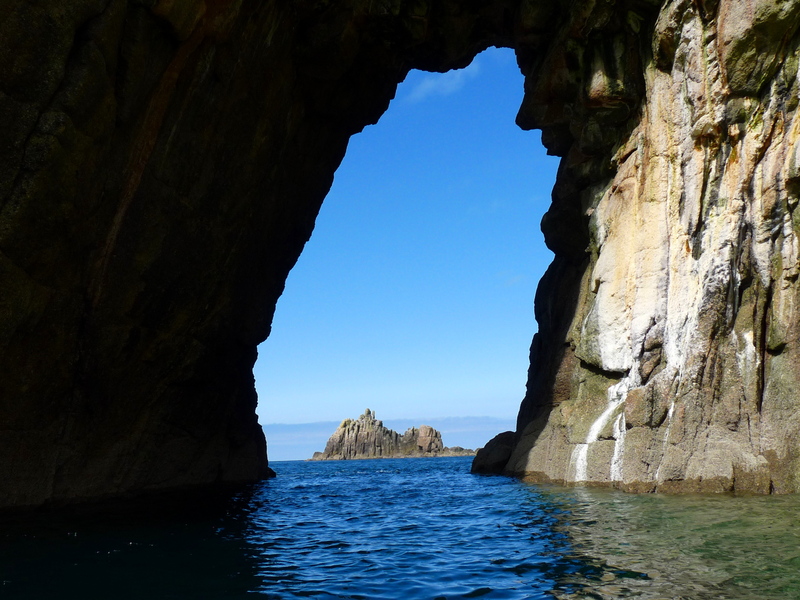 At high tide you can paddle right through the neck of the island using Merlin’s cave, emerging into a completely different view down to Port Isaac and Rump’s point. To make it even more mysterious the entrance to the cave is very difficult to find, especially if approaching from the south. On the way back up to Boscastle Bossiney bay provides a superb sandy beach stop, as well as the only colony of cliff-nesting housemartins in the southwest (I think). Long island provides the biggest highlight. An impossibly craggy and eroded fang of rock. I had my first encounter with basking sharks here. It’s a bit of a shock to get back to Boscastle itself. Although super quaint it is always heaving with sightseers. Trolleying the kayak back up through the mainstreet I never loiter. I’d sooner still be out with the sandpipers. Since the wind has livened up it’s been a bit of a struggle to find somewhere to paddle to burn off a few mince pies. The coast is out of bounds and the rivers are flooded. This makes even estuary paddling a bit of a problem as the river flow overwhelms the strength of the incoming tide. Bideford and the Torridge estuary is always a good bet however and if you have to paddle against the flow for a bit it can only be a good thing in terms of blubber-burning. Canals are very much a last resort for me. They really are quite boring and the tow paths are teeming with doggy people, and dogs. Not good for wildlife. But sometimes they are the only viable option if I feel a necessity to put paddle to water. The Grand Union Canal at Tiverton is one of the best around here. 11 miles long and no locks. It carves through some pleasant farmland and has one or two very scenic cuttings that look even better with the colours of autumn.The whirligig beetles have to jostle for a bit of space on the surface of the water with all the fallen leaves. A couple of weeks spent in North London before Christmas would have been even more like a holiday in a prison camp if I hadn’t taken Puffing Pig, my inflatable kayak with me. A handful of jaunts along the Grand Union Canal provided a welcome change to the stationary traffic of Watford and Rickmansworth. Kingfishers and Herons and the squawk of Parakeets. The water smelled a bit oily and looked a bit iffy but it was OK for a bit of a blast. I was grateful for Puffing Pig’s easy 14kgs weight to make the many portages around the locks as easy as it could be. It was my first ever visit to Berkhamstead. And my last, probably. Hopefully. Time for a quick dash up north to get lost in the wilderness for a few days, before the onset of the dark and dreary months. A blob of high pressure over Scotland promised light winds and maybe even a bit of sunshine. Wow. 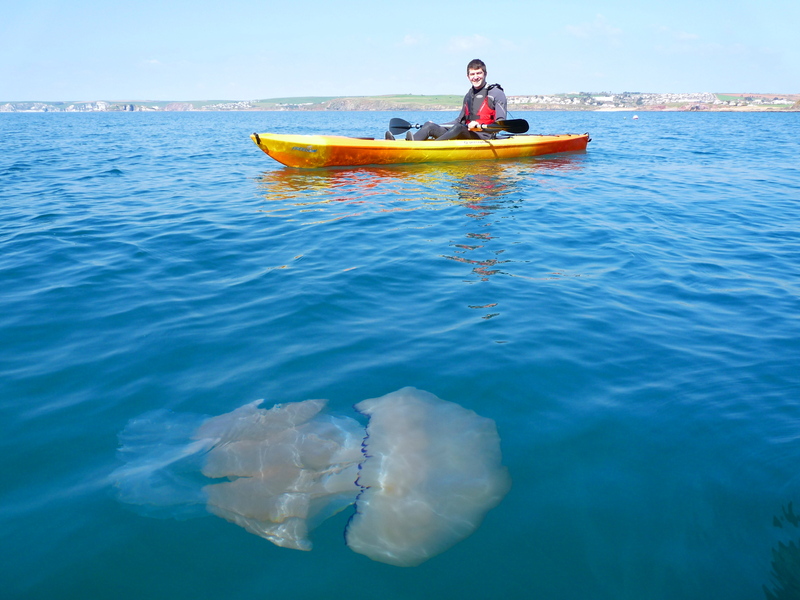 During the last twelve years since I have been paddling in the sea I have been pretty fortunate in having close encounters with all manner of fantastic sea creatures. 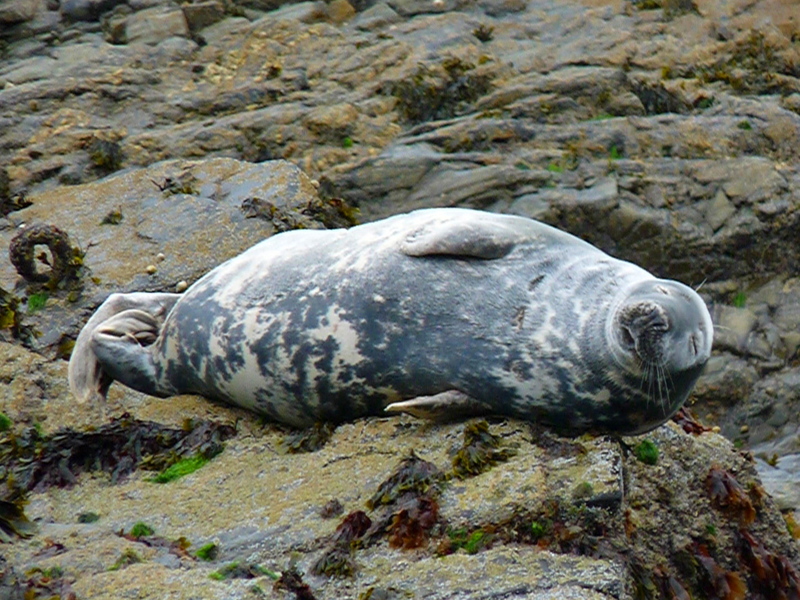 Peregrines, puffins, porpoises, three species of dolphin, seals, basking sharks, swimming foxes,deer and badgers and even a leatherback turtle. But I have never seen a whale from my kayak. It would be easy to jet off to the USA or Canada to see the Orcas or Humpbacks off the west coast, but I really want to see one in the UK. I quite like the fact that the odds are hugely stacked against me, it makes it more of a challenge. Anyway, I thought if I could manage a bit of offshore paddling north of the Isle of Skye, I might just bump into one of the Minke whales that wallow about up there. So after picking up a stupid blooming fine for spending too long in the services car park on the M6, I arrived at a sunny but windy Broadford on Skye, busting with excitement. Last time I was here it was dull and grey. My Cobra Expedition kayak got loaded to the eyeballs and I was off.I took a swing around Guillamon island (great name) en route to the north side of Scalpay. The stiff southerly wing had been forecast but was due to drop tomorrow, so I needed to be poised for action in the right place. As usual the scale of the place had caught me out. What I thought were the distant hills of Raasay were in fact part of Scalpay and it was a long haul around the coast to my planned camping place.In fact I started to get despondent as every bay was unsuitable for setting up a pitch. Maybe the 700 mile drive was taking its toll. The wildlife came to the rescue, as usual. I sneaked up on the huge bulk of a White-tailed Eagle sitting on a promontory, only lumbering away at the last minute, and was surrounded by huge numbers of harbour seals. And then the perfect sandy bay welcomed me in complete with flat grassy pitch. Unfortunately approximately sixteen thousand midges were also pleased to make my acquaintance. The eagle flew overhead squeaking in the weird way that sea eagles do. 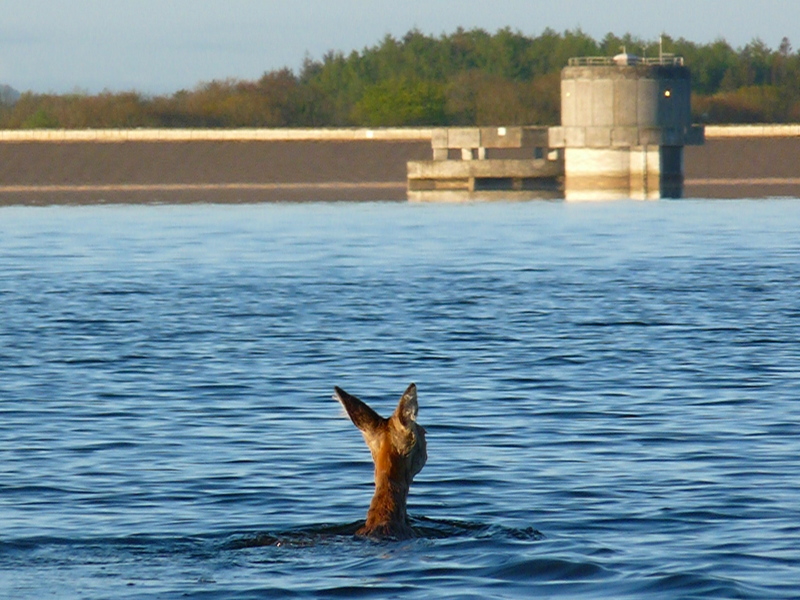 Fantastic night’s sleep, waking occasionally to the bawl of rutting stags, and the ‘worrying’ call of a Loon. 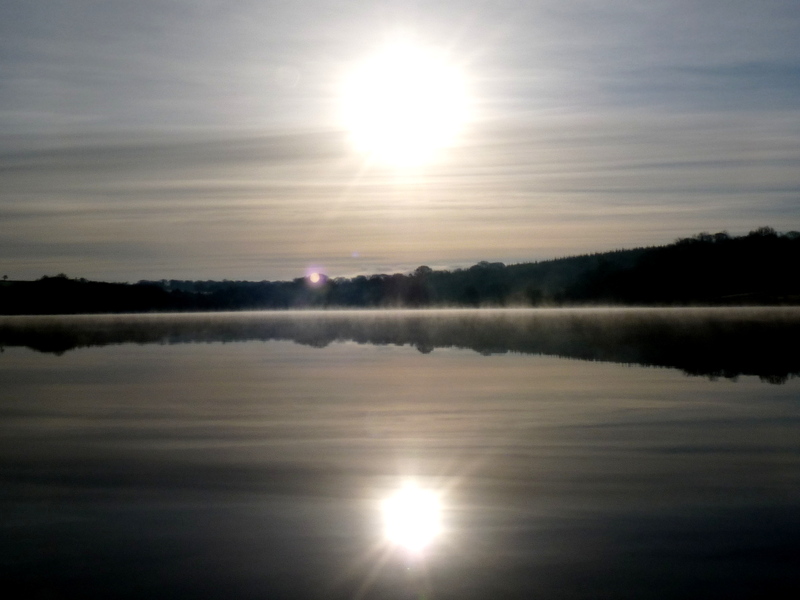 I was up and packed and paddling as the first light was damping out the stars. It was going to be a stunning sunny day and I was going to make the most of it. I hopped across to the south-eastern corner of Raasay and headed north. There was a spectacular backdrop of the saw-toothed ridge of the Cuillin mountains over my left shoulder. The mighty cliffs of Raasay looked superb in the morning sun. Waterfalls included. The light winds provided a perfect updraught for three more Sea Eagles, and a single Golden Eagle. Fab. I stopped for a brief break at Brochel to work out what to do next. Continue round Raasay and Rona would be the obvious choice. 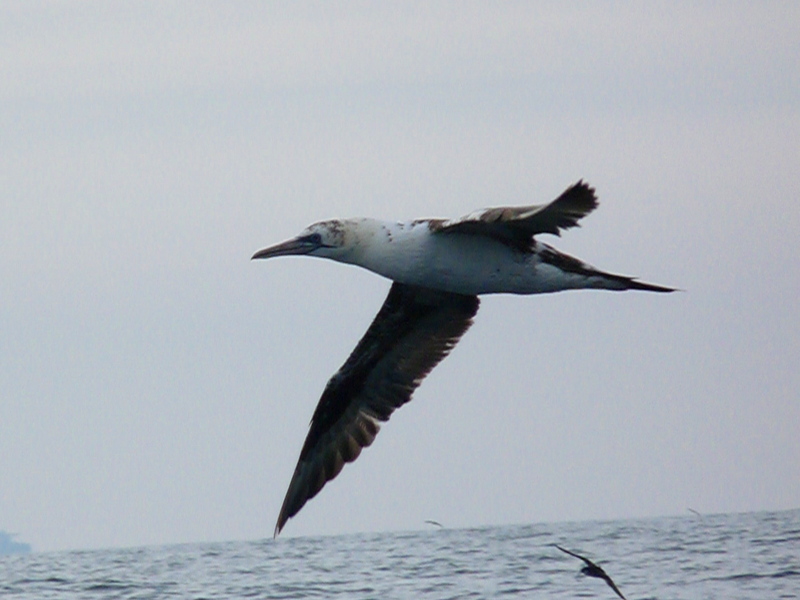 But I wanted to do a bit of offshore stuff, although the sea was still a bit choppy.I might just see that whale. As I downed a peanut butter sandwich (easy to make, but stale), the whitecaps abated and I focused on the tiny white dot of Uags bothy on the south-western tip of the Applecross peninsular, twelve miles away across the Inner Sound. I had spent a couple of nights camped there last year (sheltering from a storm) and it has got to be one of my favourite places ever. I stripped down to my vest in the hot sun and dug in with the paddle. A little bit of trepidation, all alone and a long way out. A chunky looking skua passed, not broad-winged enough for a bonxie , not rakish enough for an arctic, so must have been a Pomarine. And lots of Black Guillemots in their pale winter outfit. Unfortunately I was paddling directly into the sun and had no sunglasses so was developing a bit of a headache. 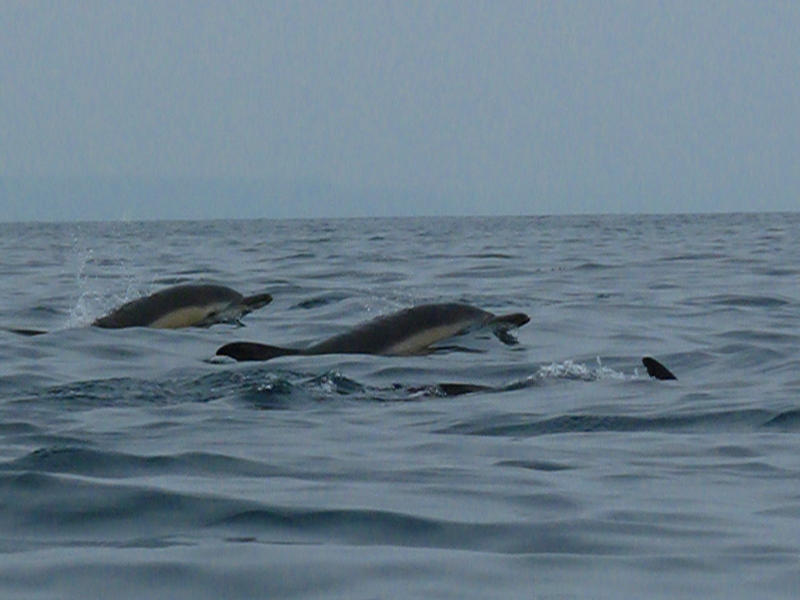 But lots of porpoises around the increasingly swirly eddylines kept me distracted. Over thirty altogether. The only two fishing boats within sight both came disturbingly close. It’s funny how that always seem to happen to me. It’s a bit like when I used to love mountain walking…..the only other people we would see all day would invariably set off on the same path a couple of minutes ahead and wear brightly coloured clothes and talk loudly and frighten away all the wildlife. At last I reached the northern tip of the Crowlins and I was pretty pooped. It was just about the biggest tide of the year, and low water, so I hauled out amongst a huge area of kelp, and sea urchins. Before nipping across Caolas Mor to Uags bothy I followed the side of the island, and was rewarded with a prolonged view of an otter hunting and diving in front of me, carving quite an impressive wake. I arrived at Uags while the sun was still strong. And I was certainly superheated by the time I had lugged all my camping stuff up from the low tide beach. So I stripped off (almost completely) and had a wash in the burn. As I was air-drying beside my tent I was taken aback to hear voices like Benny and Bjorn from Abba drifting across the water.A mile out to sea were a group of seven Swedish sea kayakers, heading towards the bothy. A very pleasant crowd, as sea kayakers usually are, and I was very grateful for their appearance when I tagged along with their flotilla for the crossing back to Plockton in thick fog the next morning. As soon as I split off from them beneath the Skye bridge, otter number two put in an appearance. The increasing headwind provided a tough paddle back to Broadford. I was going to head back down south after a visit to my brother and his family in Grantown-on-Spey, but forecast of fog on the M6 made me do a rethink. 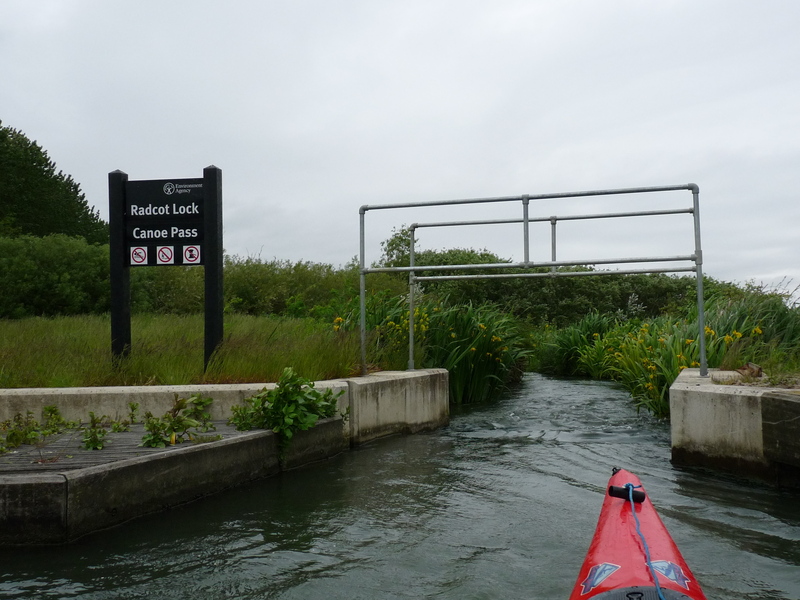 I decided to return to the west coast and paddle a circuit of the islands of Seil and Luing. Lightish winds again but this time grey and overcast. I was aware that there are some pretty savage tides in this area but because I only ended up here on a whim I hadn’t done any planning. By sheer good luck I arrived at Cuan sound between Seil and Luing at exactly slack water. It was glass still. Or maybe it was bad luck as it lulled me into a sense of false security and I thought that maybe this tide thing was blown out of all proportion. And anyway if you stick close to the shore surely you can dodge the current. Wrong. Very wrong. Oops. 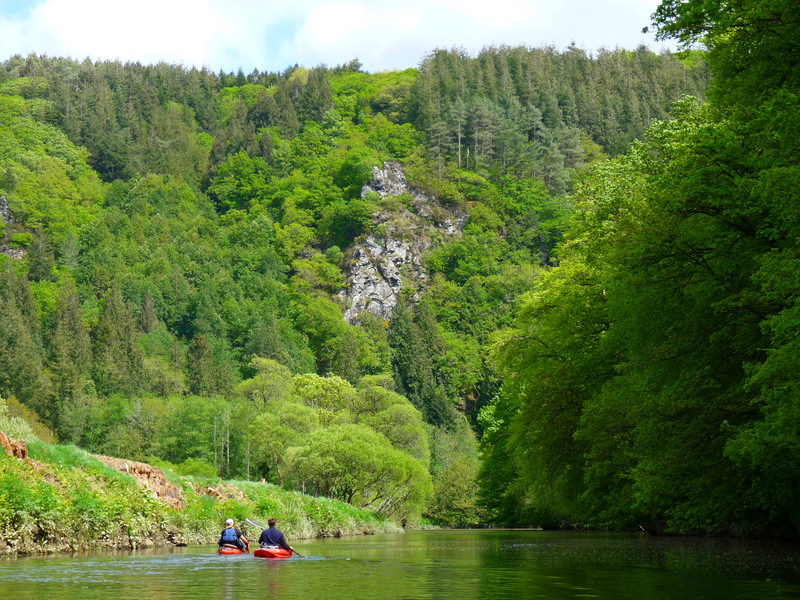 I happily paddled down the sheltered water on the east side of Luing and along the side of Shuna island. Luing was a bit disappointing as it is largely fields and not very wild.Funnily enough I remember dehorning a Luing cow in Tavistock as a student 35 years ago. On the very southern tip of Luing I had a great view of a very tame Great-Northern Diver and good encounter with an otter which came out onto a rock to munch a fish. And the wonderful haunting sound of rutting stags wafting across the water from Scarba. And another, very strange, sound. The sound of a vast amount of water moving extremely fast. No wind chop or waves or surf, just a sort of sound like a prolonged exhalation. A bit sinister. I didn’t feel the current till after Black Mill Bay. It was initially strong only at the headlands but I hit an absolute wall where the tide was squeezed between Luing and the island of Eilean Mhic Chiarain. Water was pouring over a two foot ‘waterfall’ and even the smooth water was flowing at a fearful rate. The whole sea was sloping uphill. I took a couple of minutes to prepare my muscles and then set off as fast as I could paddle. I gave it everything I had got and just about nosed my way against the current. I was paddling at about 7 mph against a 6mph flow. Blimey. I could always have hauled over land but it was rocky and rough. Good thing it wasn’t 6mph against a 7 mph current. By the time I arrived at the idiotically calm Cullipool I was absolutely roasting and down to my vest again. A bit further on, and my second passage of Cuan sound was rather different to the first. ( I paddled the two islands as a figure of eight). It was absolutely ferocious.Really sinister swirling whirlpools and upwellings that made me brace the paddle on the surface in expectation of a wobble. The ferry crossed the current pointing upstream at an angle of forty-five degrees. And into the shelter of Seil sound it was suddenly all calm again. It was further than I expected to the Bridge over the Atlantic at Clachan (maybe because of my exertions around the west of Luing, and twenty miles covered so far), and I just squeaked through the tidal narrows, bottom of kayak scraping the sand, before they dried out. Once again paddling against the current! I was pretty shattered as I at last arrived back at Easdale and the line of squat slate quarrying cottages, not looking their best under more typical leaden Scottish skies. Time to head home now the fog had cleared. I have got fed up with lifting heavy kayaks onto the roofrack of my car. At 23kg the Cobra Expedition isn’t too bad, but the Tarpon 160 is a beast at approx 35 kgs (I think Wilderness, the manufacturers, are a bit coy about its exact weight). I like to paddle by myself and it takes a supreme effort, both physical and mental, to ‘clean and jerk’ kayaks onto the roof. I have drawn a few suspicious (and even sympathetic) glances from passers-by as I square up to the task like I’m about to toss the caber (which would be a lot easier). Sooner or later one of my discs, or some other critical component of my back, is going to give. So enter the GUMOTEX SAFARI. 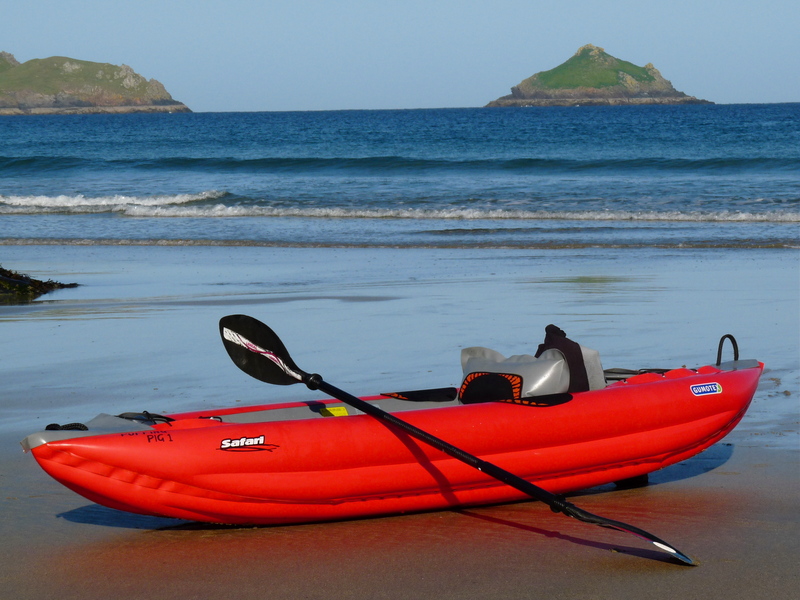 An inflatable kayak. 10ft long 28″ wide. You’ve got to be joking. You can’t possibly go offshore kayaking in that! Yes I can.And who cares that it’s a glorified lilo when it weighs only 14kgs and you don’t even have to hoist it onto the roofrack because it can fit IN the car? Being short and fat (although it isn’t particularly wide) it must surely suffer from a low top speed.Well yes but unbelievably this doesn’t seem to be a problem. Gumotex seem to have been able to defy the basic laws of kayak speed, shape, and everything. It is noticeable how much bigger a ‘wash’ is created while paddling along, but this seems to be offset by the superbly comfortable inflatable seat and footrest which encourage a powerful and sustainable paddling technique that you can keep up all day long.Yes you are probably inadvertently paddling a bit harder but it means you burn of a few extra pies. It’s a win win. Having dibbled with some very long and slender (and very tippy) kayaks , as I’ve always had a bit of a desire to clock up a bit of pace and notch up a few miles, I am no stranger to the relationship between width and length of kayak and speed through the water. So I was very wary about biting off more than I could chew when I took Puffing Pig (there was really no other choice for a name) out for it’s inaugural BIG paddle at Land’s End. Puffing Pig, incidentally, is the old English term for a harbour porpoise because of their characteristic ‘piff’ they make when they breathe. 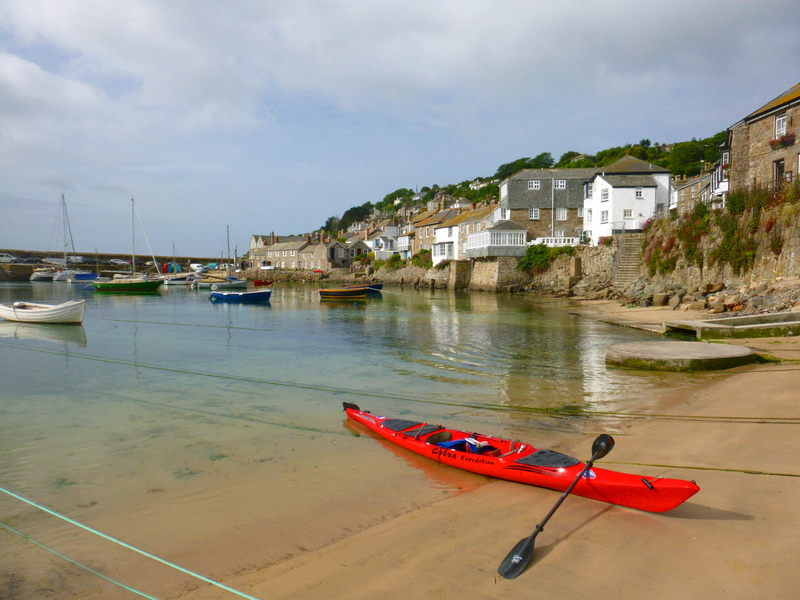 I was pretty chuffed when I completed the 17 miles between Penzance and Sennen ,rated as a Grade ‘C’ paddle….potentially pretty hairy. 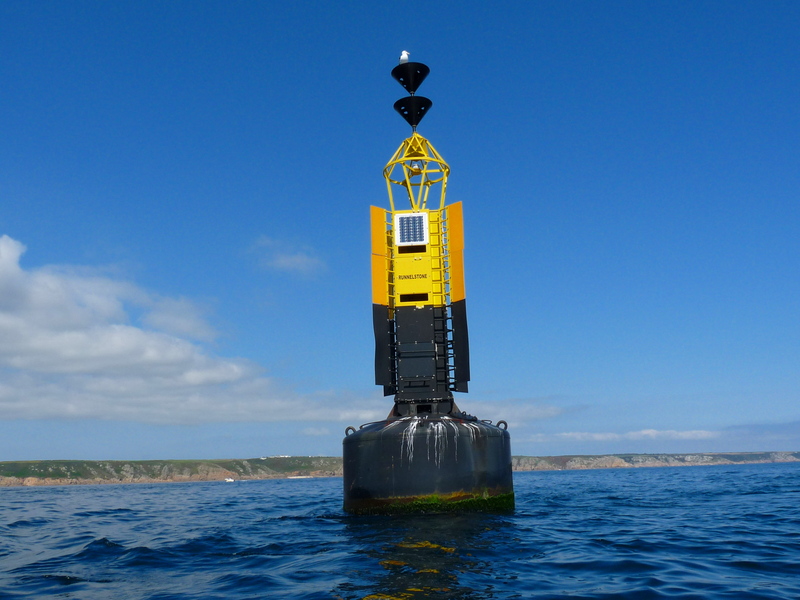 Fortunately it was about the flattest day in history in West Cornwall, with ultra light winds and no swell, and very small neap tide minimising the notorious currents around Gwennap Head and Land’s End itself. 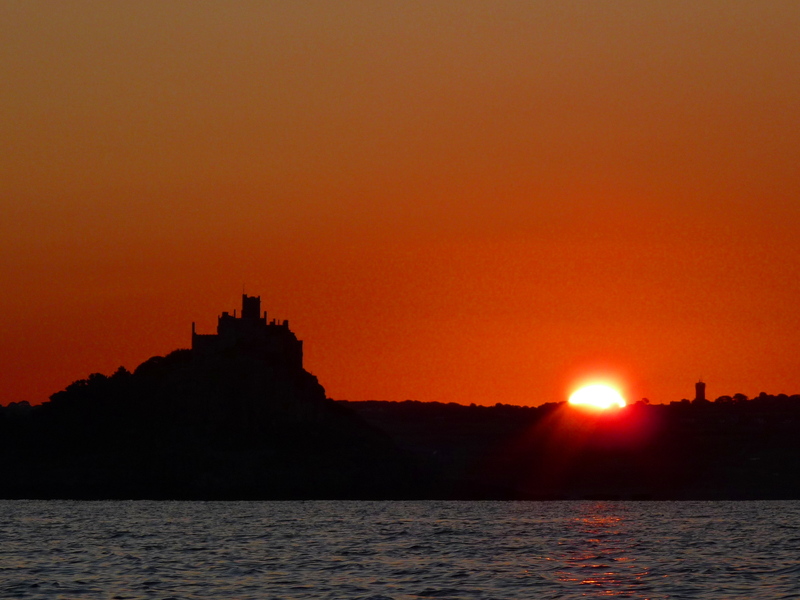 I was then going to catch the bus back to Penzance, but it was such a lovely afternoon I wasn’t in the mood for intermingling with humanity (favouring instead gannets and seals and the odd porpoise), so I paddled all the way back. 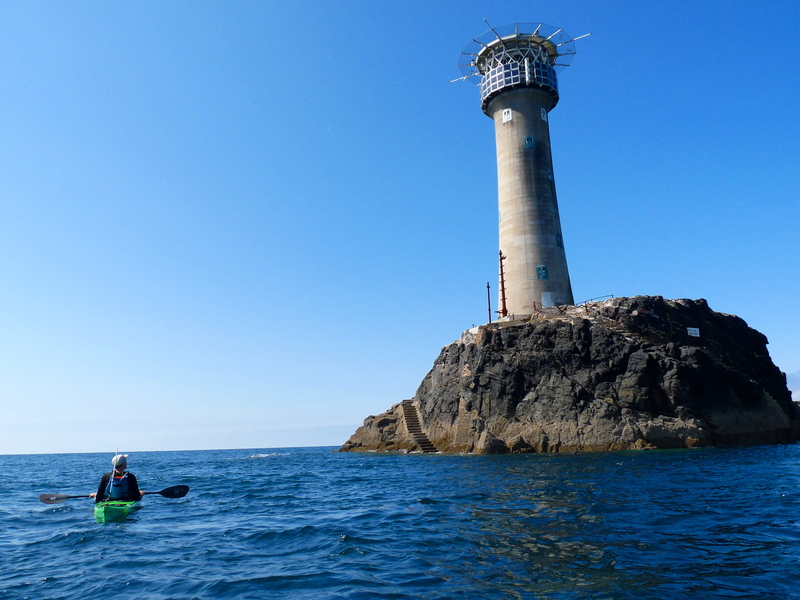 For this return trip I kept a mile or so offshore all the way , passing Longships lighthouse (in the company of a paddler who was en route to Scilly) and around the Runnel Stone buoy. Thought I might encounter the humpback whale that had recently be seen in the area, but needless to say didn’t. To make the trip even more cushy the wind switched from east to west so I essentially had a breeze from behind for the whole 34 miles. Lucky Puffing Pig! 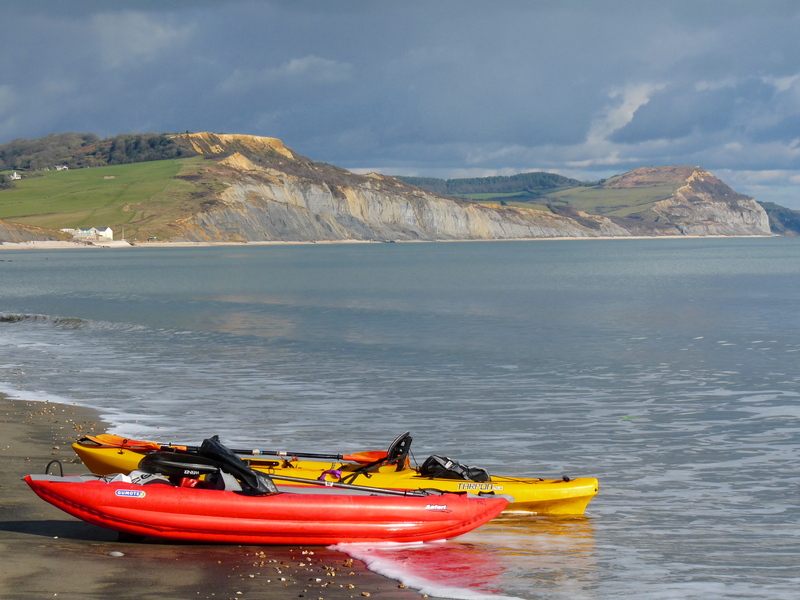 I’ve only once covered a greater mileage during a coastal paddle in a normal (ish) sea kayak. I get the impression that the ‘natural ‘speed of the Gumotex Safari is about 75 % of a normal SOT , but this is balanced by the high level of comfort and superb paddling posture encouraged by the inflatable backrest and inflatable footrest. And it’s even got scupper holes so that when you go surfing or tackle a bit of white water it is self draining. So what about fishing? No rod holders obviously but with a bit of elementary DIY you can rig up a pipe in the rear storage area to act as a rod holder and go out and bag yourself a couple of fish. One issue I nearly overlooked. Would a bass thrashing about in the footwell puncture one of the chambers with its spiky dorsal fin? I wasn’t going to chance it so kept the fish in a bucket while dehooking. It doesn’t make for the best photo but better than being marooned in a rocky cove near Hartland Point. It’s all too good to be true. The ultra light weight of the Gumotex Safari means you don’t hesitate to carry it over a long section of rocks or rough ground, or groan with dismay when confronted with another lock on a canal. You can be out of the car and on the water and away in a minute so what you might lose in hull speed you gain with minimising faff time at the beginning and end of a trip. Inflatable kayaks have a bit of a reputation at being susceptible to wind.Understandable as they are glorified airbeds, and I have head to rescue a few of these (airbeds that is)as they, and their occupants, have been heading out across the English Channel fanned by an offshore wind. This lack of grip on the water, and poor directional stability, is eliminated by the installation of a tracking fin, essentially the same as a surfboard. Fantastic, it now behaves like a ‘normal’ kayak and is no more vulnerable to wind than any other kayak, maybe less so. And maybe best of all, when you have finished your trip, you don’t have to paddle all the way back, you can fold it up, stick it in its dedicated rucksack, and catch the bus. 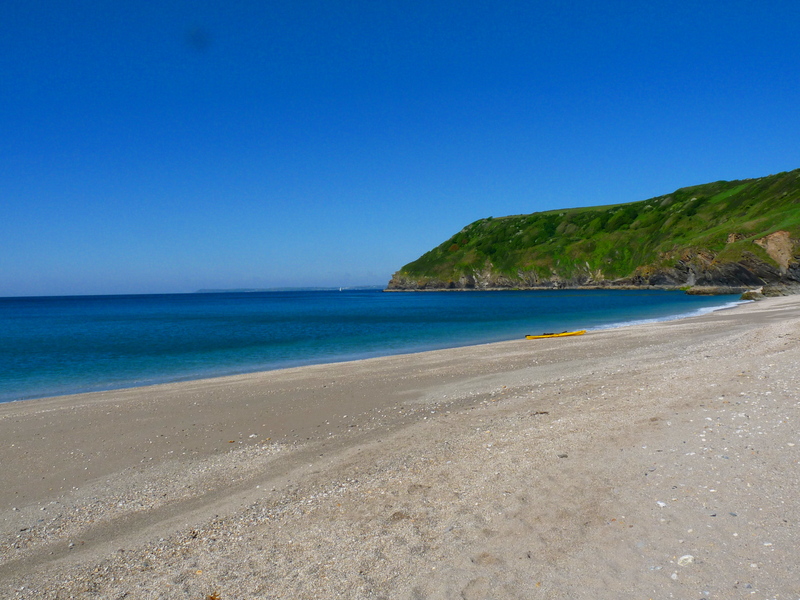 If you happen to be a shark and you want a nice quiet life away from the risk of being netted, hooked or harpooned, you could do worse than choose the North Cornwall coast. It’s just too hostile for any coordinated type of fishing activity. The few fishing boats that sneak out of Boscastle and Bude during a weather window are soon sneaking back into shelter of their harbours again. 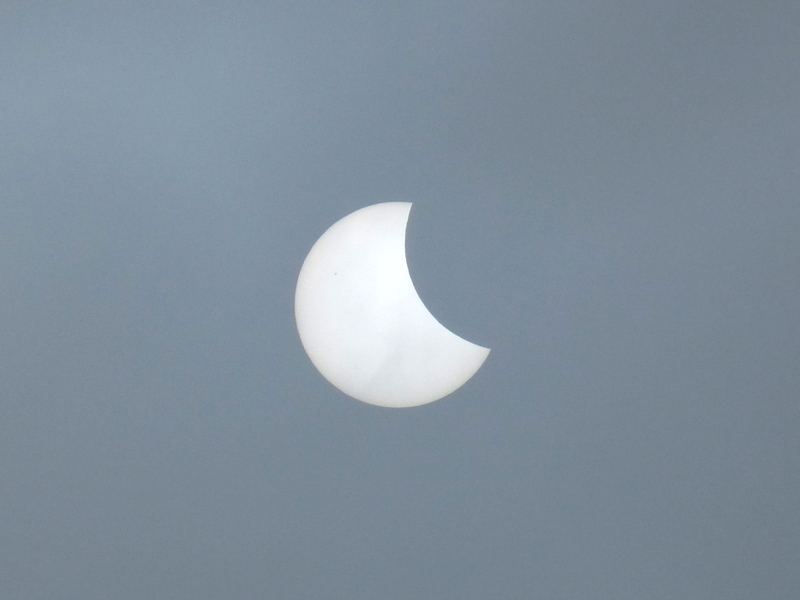 And when it comes to the sort of prolonged period of calm that is required for a shark-fishing session from a kayak, it’s probably quicker to wait for the next solar eclipse. (here’s the last one, by the way, a couple of months ago. This summer the sea conditions have been particularly bad.Almost continuously windy, and when the weather does pause for an intake of breath, the residual swell still prevents any kind of relaxed launch from a beach that will not dose everything and everybody in huge quantities of salt water. 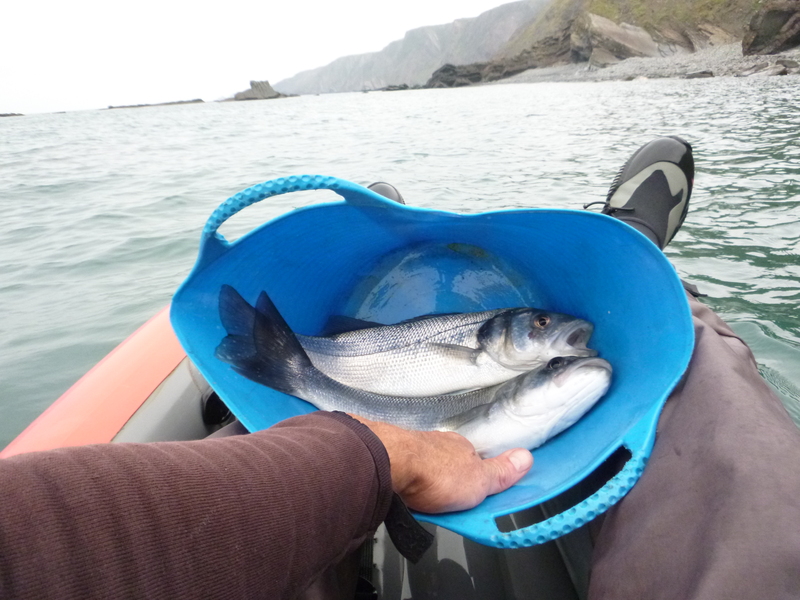 So all fish that are vulnerable to a couple of inept kayak-fishermen have been quite safe….up until now. 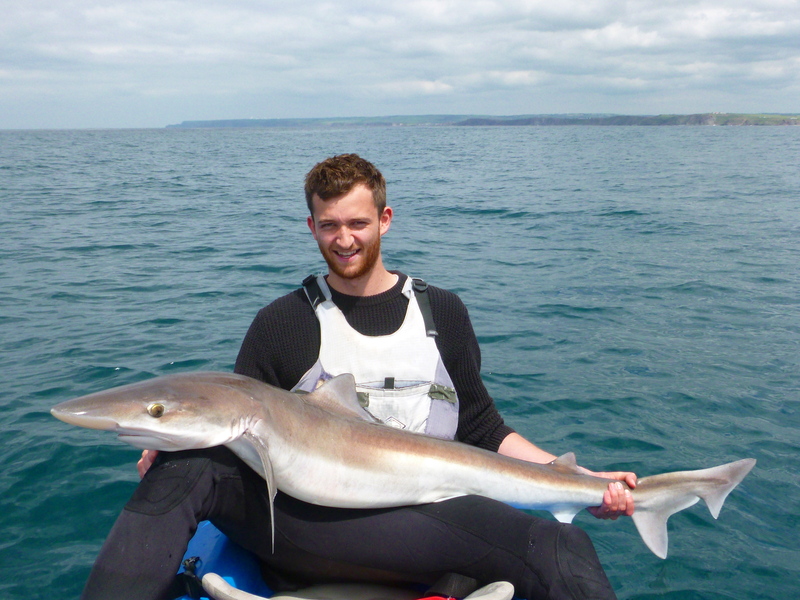 I really don’t know what I am talking about when it comes to kayak shark-fishing, but I get the impression that Tope appear in North Cornish waters in May and June, then disappear in July, and the come back again in August and September. Maybe I read this somewhere, but I do seem to remember that in previous years I have spent quite a lot of time drifting about in July and not catching a lot. Anyway, beggars can’t be choosers. We had the promise of a day of light winds and a mere three foot swell and 20 degrees. We were off! With absolute minimal fishing tackle as usual. I can’t stand the faff of complicated gear, fishfinders and boxes laden with clobber that would probably sink our double kayak anyway. One rod and spinning reel each, 30 lb line, plus a wire trace and massive hook. We adopted the same tactic as last year. I was the engine in the back seat with the paddle. Son Henry was in the front seat armed with fishing rod and portion of chocolate cake. First we had to catch a mackerel as bait. Why is this so difficult?. If you don’t want to catch a mackerel they will come in by the bucketload, but as soon as the pressure is on the sea seems to be devoid of anything even vaguely mackerelly. However at last, after nearly two hours of paddling , Henry pulled up a stick of four decent mackerel. Perfect. They were soon converted into mackerel flappers and legered to the bottom, and the long wait began. The ‘set up’ was as good as I could have hoped as we had paddled three or four miles into a lightish head wind, and so would now be pushed back up the coast towards Bude and hopefully be level with our launch beach after three or fours hours drifting, by which time we would either be bored stiff, or hopefully had a thrilling shark-style encounter.The odds were very heavily stacked towards total failure, as there just didn’t seem to be a lot of fish about. And so we drifted.Total silence apart from the single ‘piff’ of a porpoise which I glimpsed once and then, in typical porpoise-style, was gone. And we drifted. And Hezzer fell asleep . Even more intense silence. Apart from the distant constant roar of the waves crashing on the rocks on the shore a mile away. Being an ex-trainspotter and ongoing birdwatcher I thought my threshold of boredom was very high, so I was quite surprised that I was the first one to ‘crack’.Maybe it was because Henry was asleep I reeled in my mackerel and their was not so much as a hint of a nibble on it. 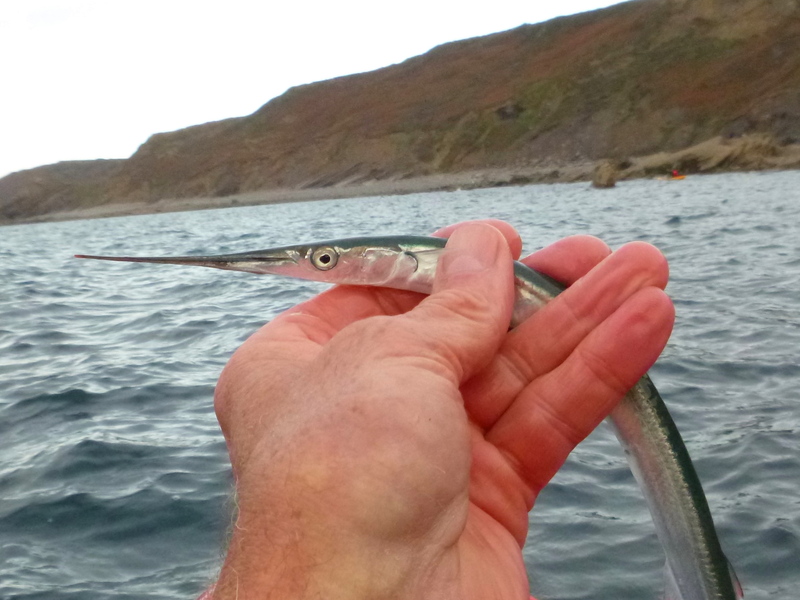 So I converted to a quick bit of bottom fishing with feathers and rapidly hauled up a couple of tiny whitihg. So small in fact that I immediately reverted to using the mackerel as bait as waiting in the vain hope to catch a whopping fish was going to be more fun than reeling in tiddlers that you can’t even tell are on the end of your line. We made lunch last as long as possible. And tea. Then started to discuss reeling in as we drew level with our launch beach. Four hours without a single tug or rattle on our rods. Suddenly the tip of my rod leapt as something violently worried the bait. Then nothing momentarily until it tore off wth Hezzer’s line. Are you sure it’s not the bottom? Absolutely not. The rod tip was leaping about all over the place.Our adrenaline levels rocketed from zero to danger level in a fraction of a second. As line continued to be poured out of Hezzer’s reel, he worried that it would completely run out. But then the fish halted and Henry pointed the rod to the front of the kayak so the shark could pull us a long for a bit to tire it out. 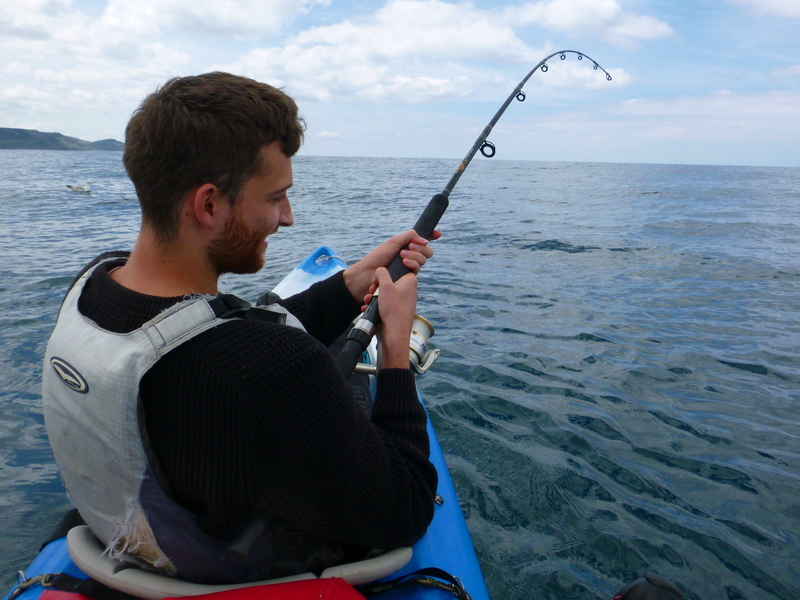 This is where shark-fishing from a kayak is a bit more ‘forgiving ‘ than from a boat…..a mighty tug from a fish will be cushioned by movement of the kayak and so lines are less likely to break. After a very satisfactory struggle to haul the Tope up from the depths we both started to peer over into the clear blue water to catch a glimpse of the fish. 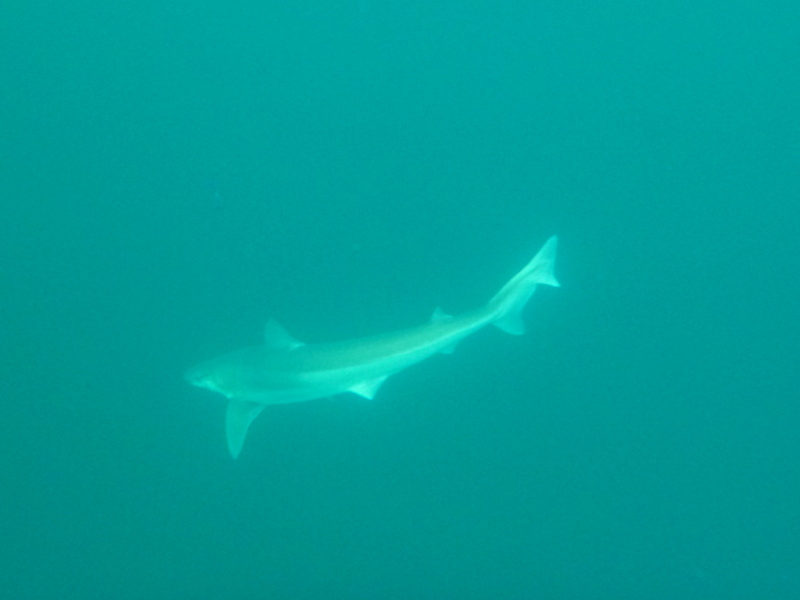 As usual it seemed absolutely enormous and as usual dived again when it caught a glimpse of us. 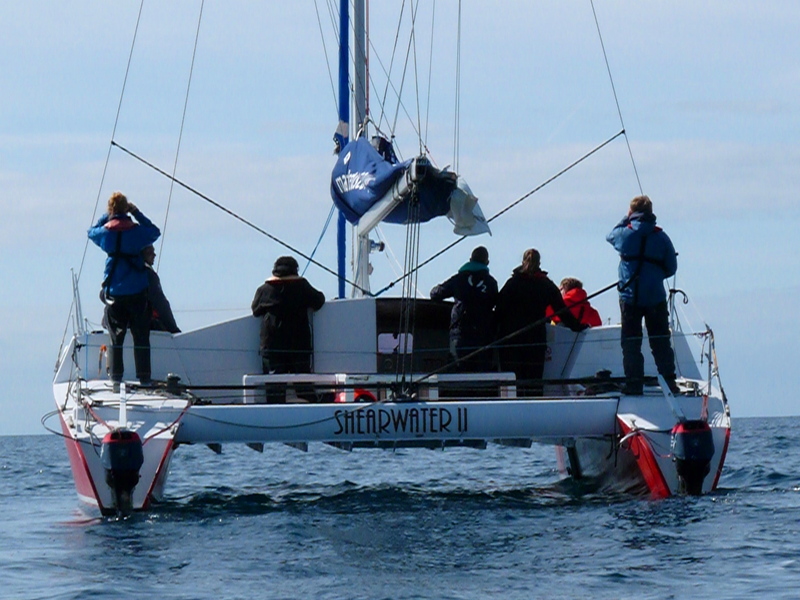 This scenario was repeated at our first attempt to get it on board and we got a bit of a soaking from thrashing fins. I was more concerned than previous similar efforts that one of us was going to get tangled up in the wire trace as the fish tried to swivel. Must be a sign of getter older. I was also a bit concerned about getting bitten. The back seat of a double kayak is quite a cosy place to share with a five foot fish with a potential attitude issue. At last in it came, and the hooked was quite easily removed from the corner of its mouth. Getting Hezzer to rotate in his seat and passing him the Tope for the photo was probably the most challenging manoeuvre of the afternoon but once accomplished successfully we gently lowered the fish back into the water and it swam off vertically downwards apparently neither shaken nor stirred. 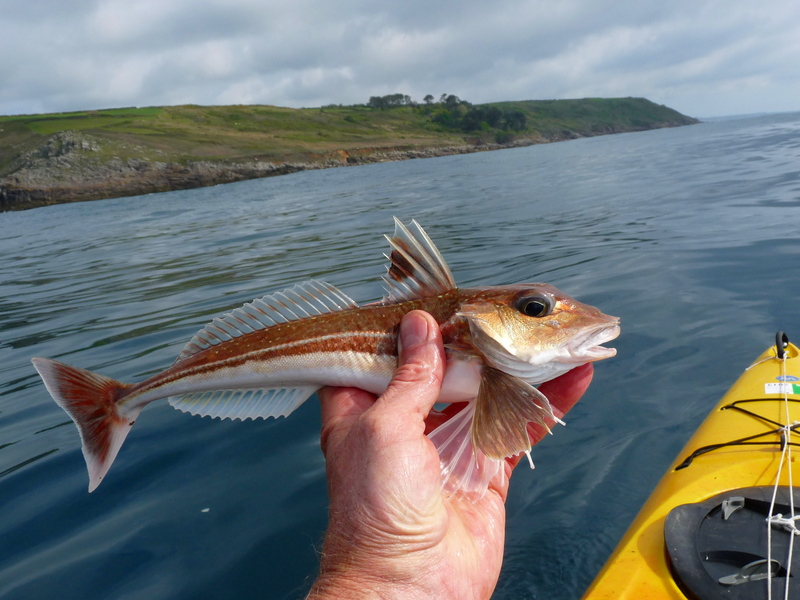 It can certainly relax for a while as there is no prospect of it being hooked again for at least a couple of weeks with the impending return of wind and swell making the sea a no-go area for kayak fishing. Where on earth do Barrel Jellyfish think they are going? And where on earth have they come from? And why on earth do they like to congregate off headlands where their unbelievably weak and slow swimming action is even less effective at getting them where they want to go because headlands are always the places where tidal currents are strongest. They will end up going with the flow whether they like it or not. 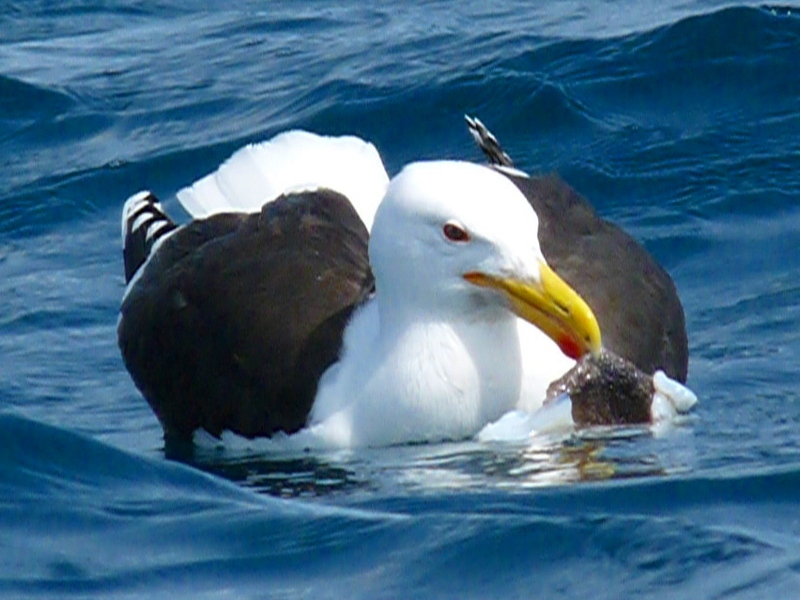 But however casual and frilly their approach to life, they seem to have hit upon a winning formula as this Spring they are around the coast in vast numbers.Maybe they do know what they are doing despite apparent frailty and vulnerability. They are big (3ft long) and a bit ghostly and very weird. 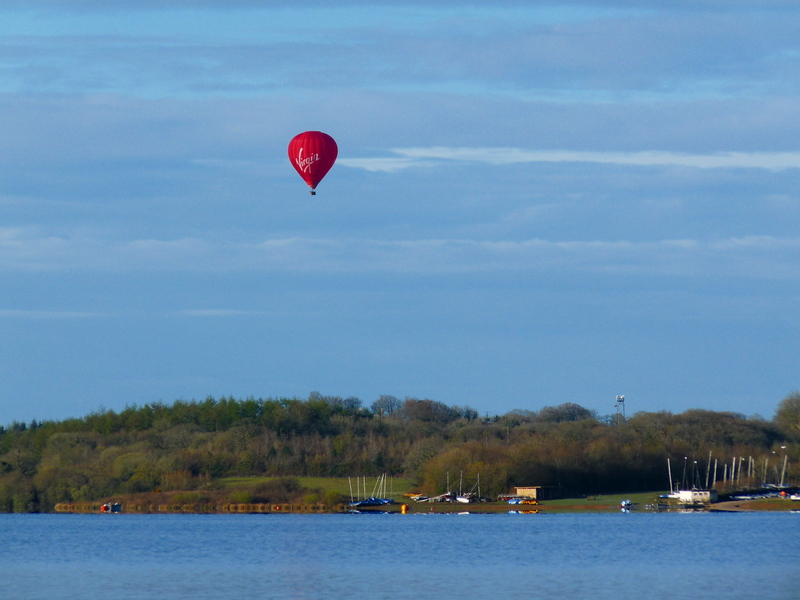 And great to see as you cruise silently above in your kayak. And how excellent is it that the most successful creature around at the minute does not even have a brain. It confirms that life is sustainable without an i-phone (and having a casual and frilly approach to life is not necessarily a bad thing). 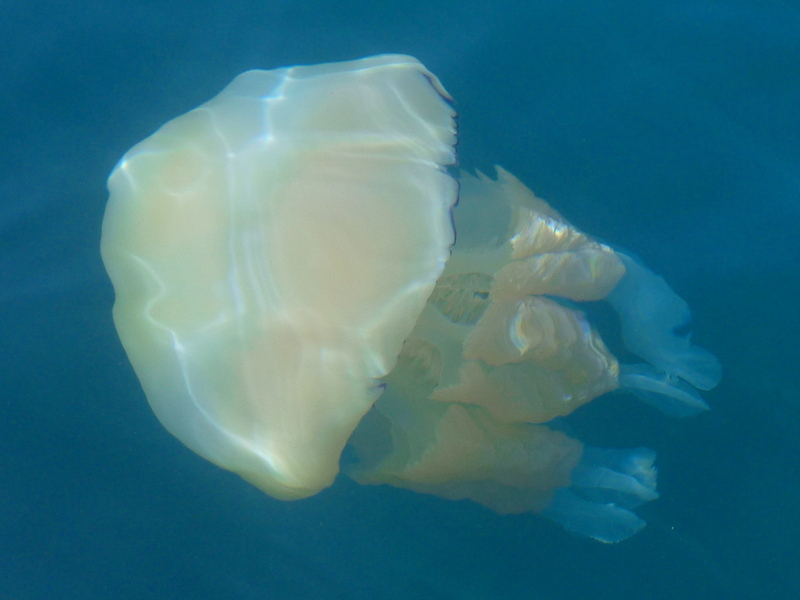 In Mount’s Bay the other day just beyond St. Michael’s Mount there was a swarm of Barrel Jellyfish.Many hundreds of them. 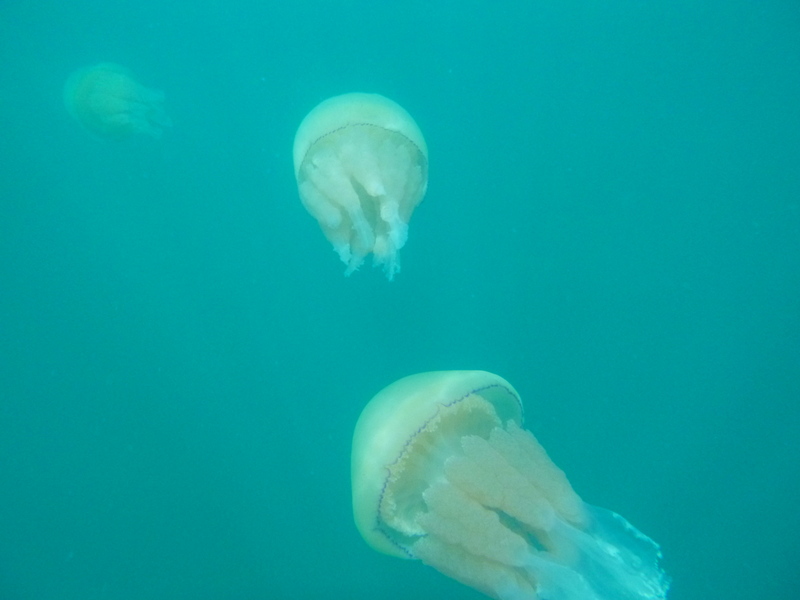 Taking random photos underwater from the edge of my kayak would show up to five jellies on screen at any one time. Amazing. 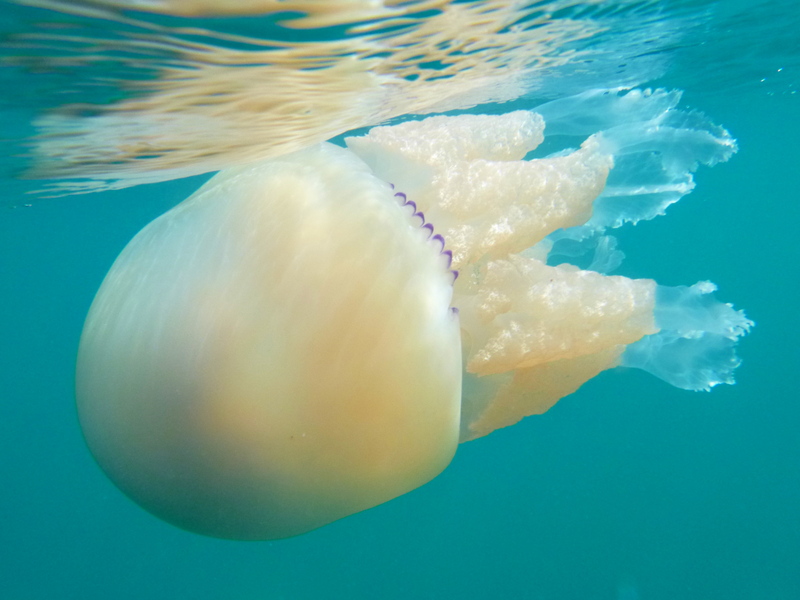 I wonder if it means that the sea creatures that feast on jellyfish, Sunfish and Leatherback turtles, will also put in a big appearance this year.Hopefully. 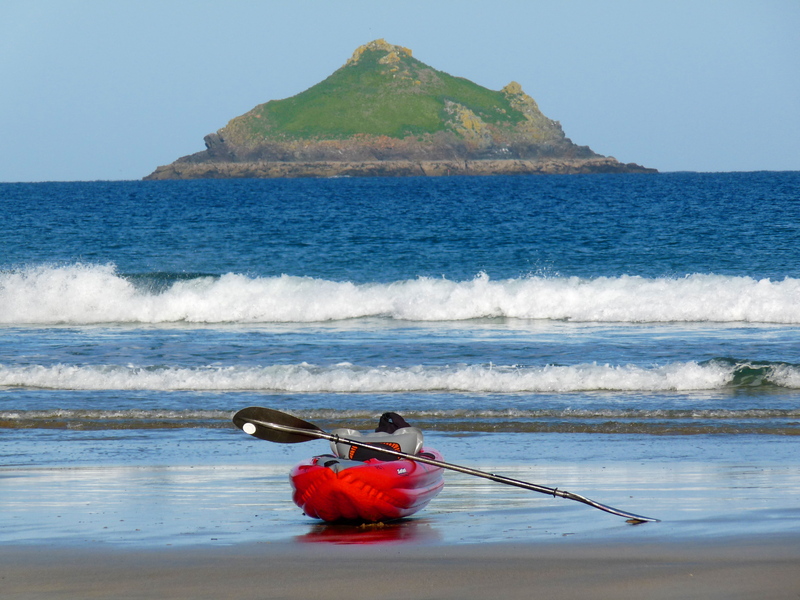 May’s weather has, as usual, been a bit catchy especially, as usual, down here in the South west with strong winds making the sea out of bounds to kayaks for much of the time. But being forced to head inland for a bit of kayaking action is not necessarily a bad thing. The Tamar estuary upstream of Calstock is always a favourite. And a two -day trip to the Upper Thames provides an unexpected ribbon of wilderness within a shout of Swindon. Trilling Curlews, cuckoos , screaming swifts and bushes full of a variety of singing warblers. 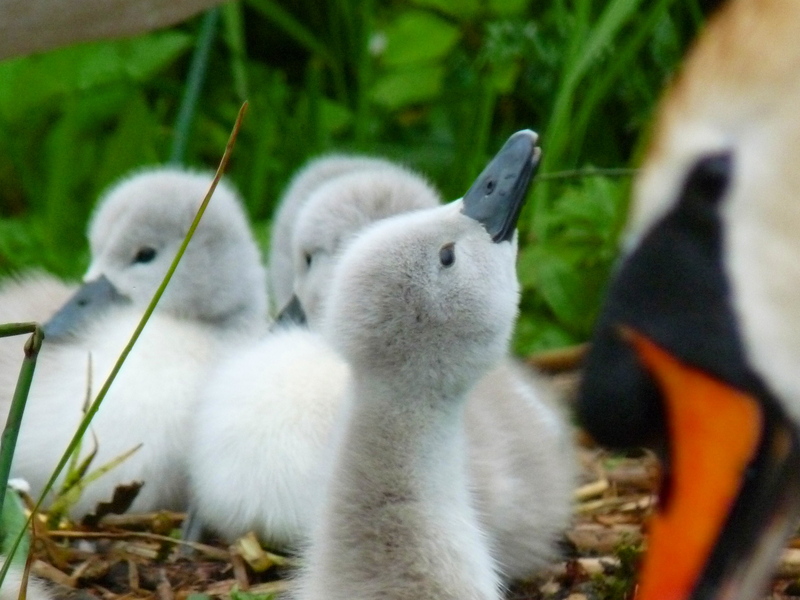 And as many ducklings, goslings and cygnets as you would care to see. Locks and lockkeepers cottages remained unchanged for centuries. 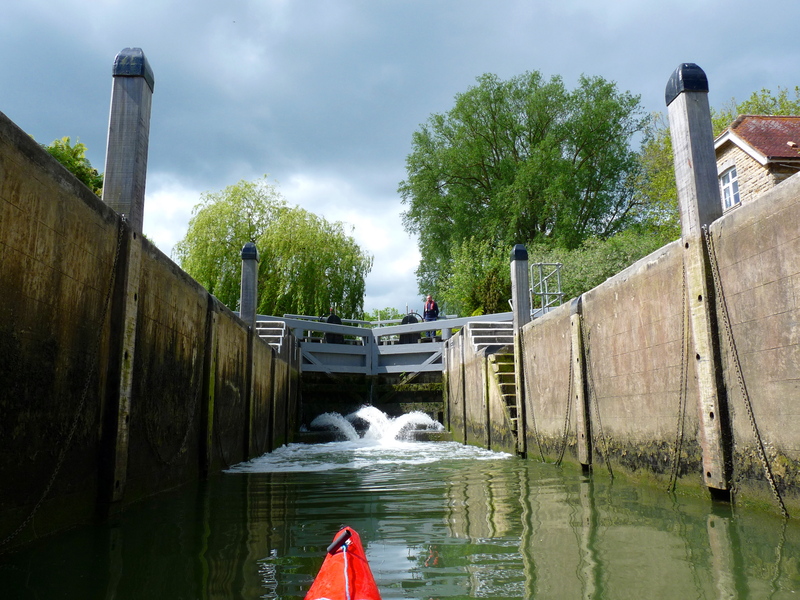 The canoe pass at Radcot lock is inspirational. More please. 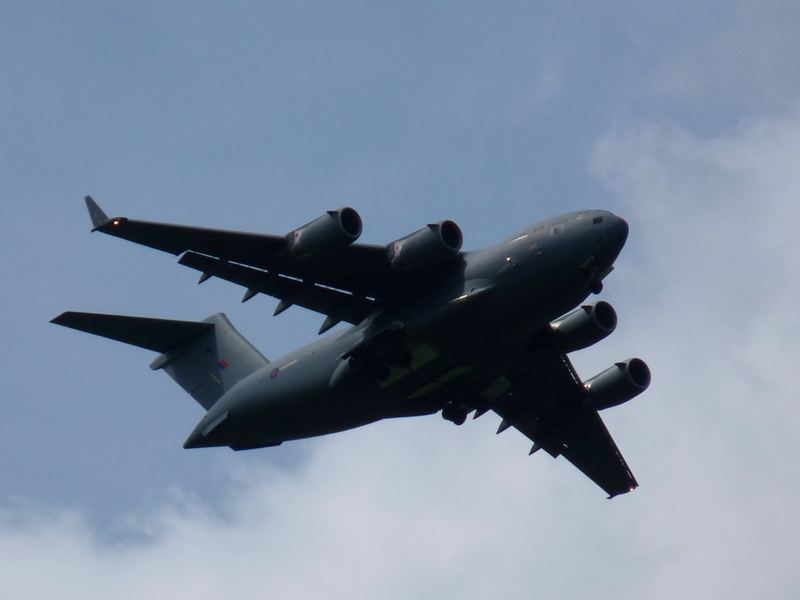 Only one thing split the sound of nature, and it kept going round and round as it practised landing at RAF Fairford.About as unfeasible as a Barrel Jellyfish. I have ventured out for one brief fishing session off the south coast during a window of quieter weather. My first mackerel of the season was followed by half a dozen pollack, a couple of whiting and a grey gurnard. All caught on a string of silver foil feathers. All small. All put back. 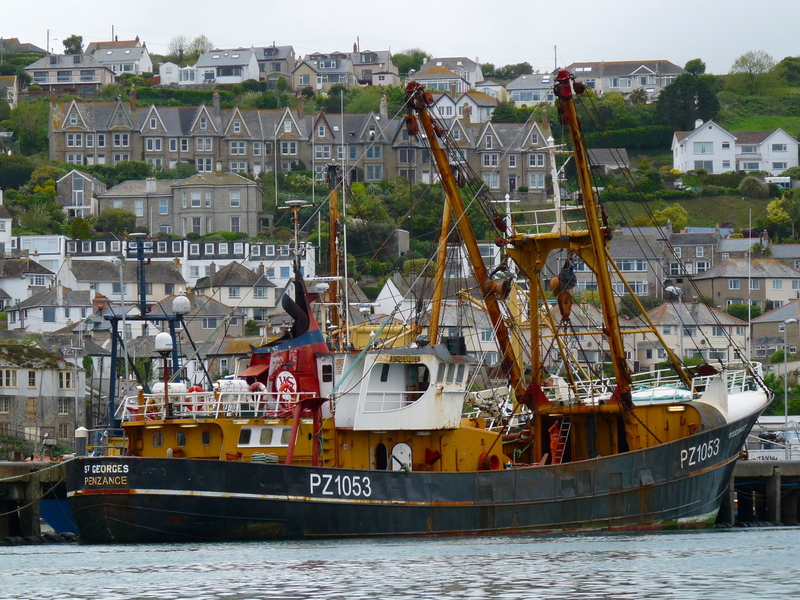 While in fishing mode I took a spin round Newlyn harbour to see how the ‘big boys’ do it. My most recent visit to Penzance provided BIG excitement. 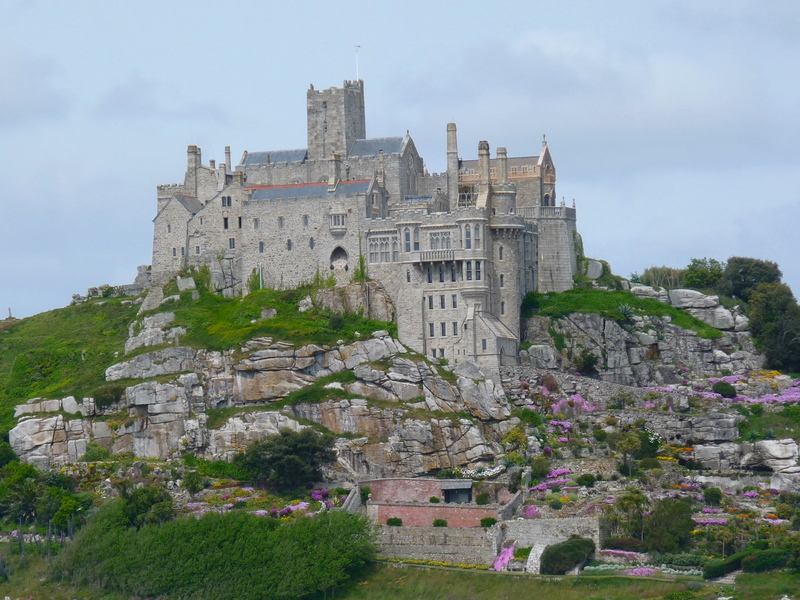 Not just for the vast numbers of jellyfish and the scenic backdrop of St. Michael’s Mount jutting out into the middle of the bay. Launching from Marazion I ventured out offshore in the hope of encountering some sea creatures. 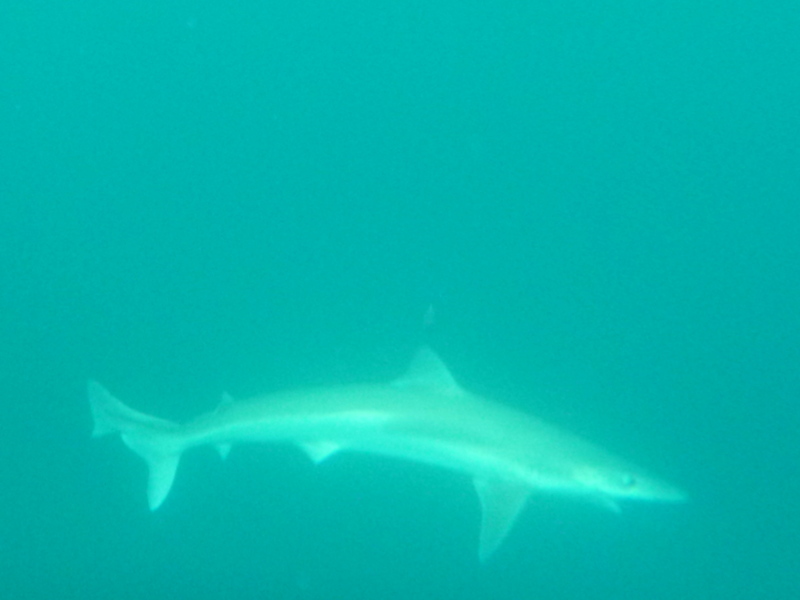 I soon saw a big fin at the surface, but too sickle-shaped for a shark and too big for a common dolphin. In fact too big for a bottle-nose dolphin as well, I thought. I got my camera ready and of course did not see it again. For a while anyway. Ten minutes later a different big fin surfaced quite close beside me and I floundered to get my camera poised in the choppy conditions. It surfaced briefly four times then once again was gone. I was pretty sure this was a Risso’s dolphin considering the size and shape of the fin but was keen to get a better view. Over the next few hours I saw the big fins about ten more times. 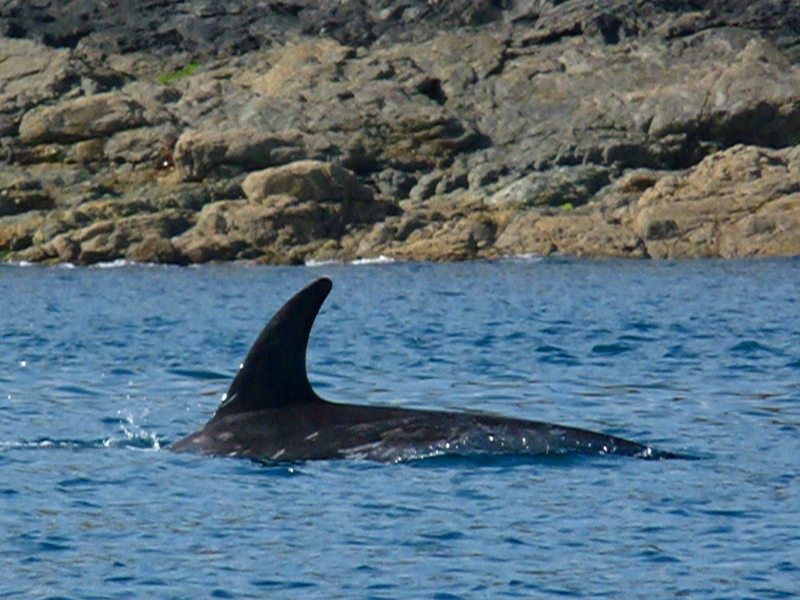 Usually a single, big, dolphin but also one or two small groups. 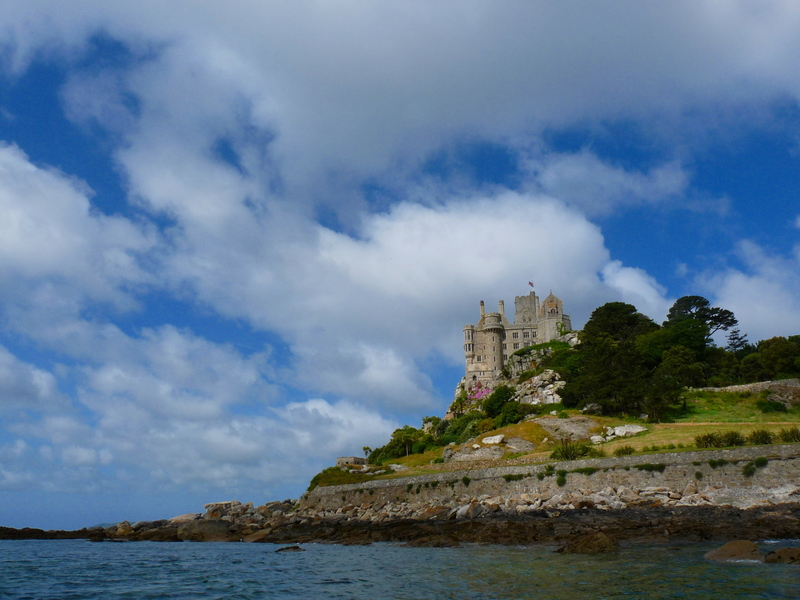 And in the far distance beyond St. Michaels’s mount a wild splashing that must have been of dolphin origin. I paddled over to have a look, saw nothing, paddled a mile back to the middle of the bay, and glanced back to see the exact splashing again where I had just been. So I paddled back,waited around for half an hour, nothing appeared, so I paddled back to the middle of the bay again, and unbelievably the splashing once again appeared in the far distance, in the same place. Maybe they just didn’t like me. As I pondered over a ham sandwich (with lettuce and coleslaw), another big fin sliced the water in front of me, this one looking very bleached..surely a Risso’s. As I was waiting for it to resurface a school of very active but not particularly friendly common dolphins appeared and surged all around. 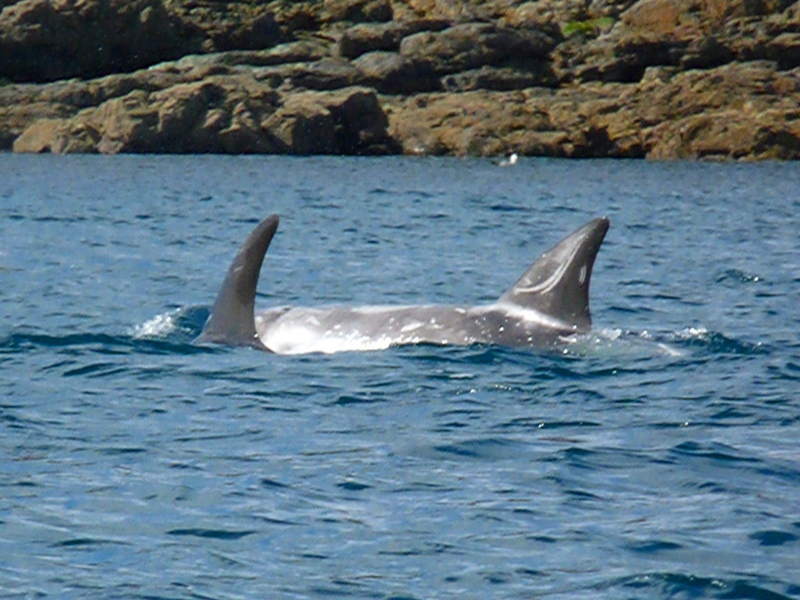 Very much smaller than the Risso’s and much more dashing. Impossible to photograph. 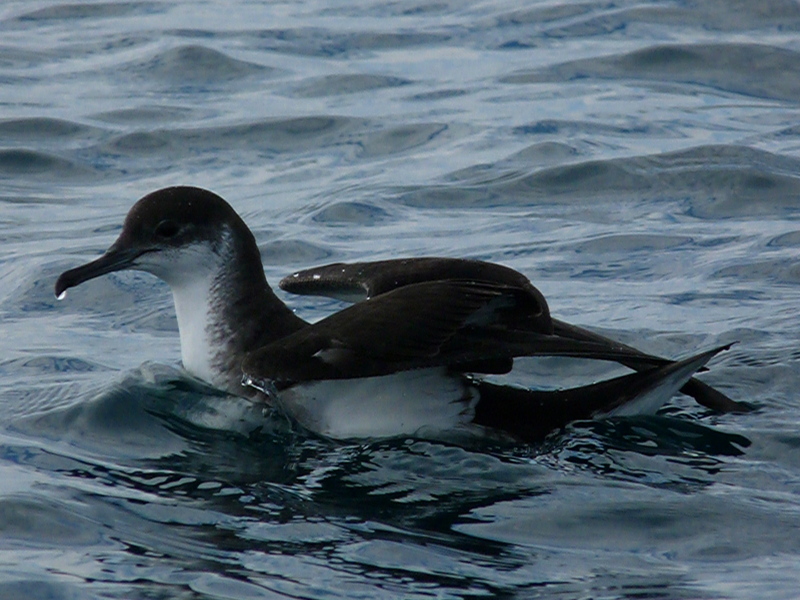 I suspect the wildlife watchers on Shearwater II had a better and more stable view than I had. Before I headed for home I caught two very brief glimpses of Risso’s dolphins breaching. One had a lot of white on it and the other was greyer but showed the characteristic blunt head. I didn’t get to see the ‘classic’ scarring marks that Risso’s are supposed to have on their bodies. They didn’t seem to be inquisitive like bottle-nose dolphins and were intent on feeding, apparently on cuttlefish. The local gulls were very pleased to clear up the pieces. 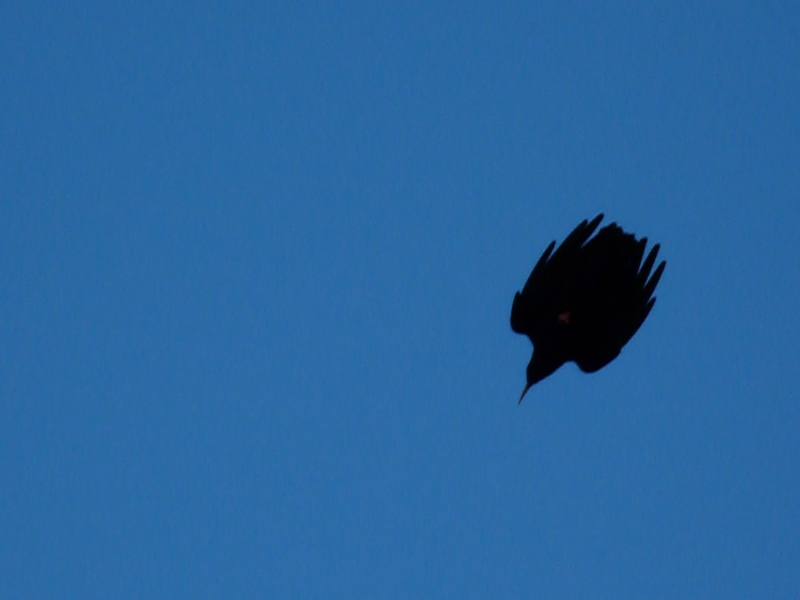 This Greater Black-back puffed himself (herself) up to look even bigger and even more threatening than normal. 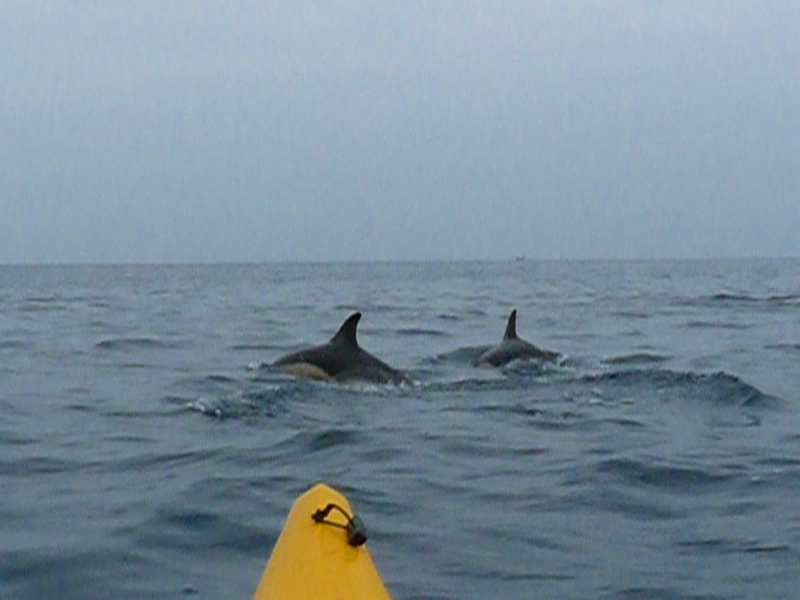 So very pleased with a new dolphin species seen from kayak. Just got to see that whale now!